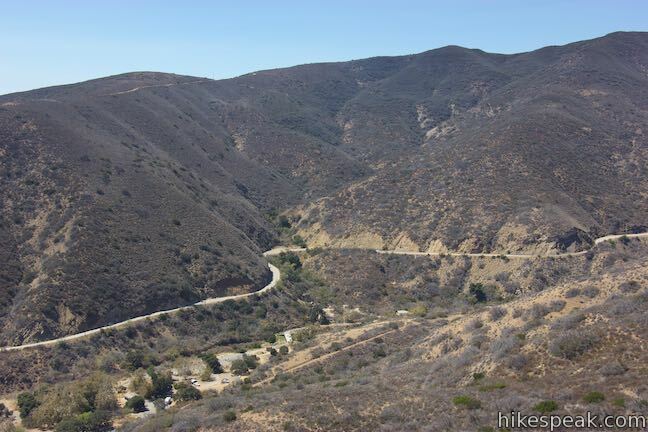 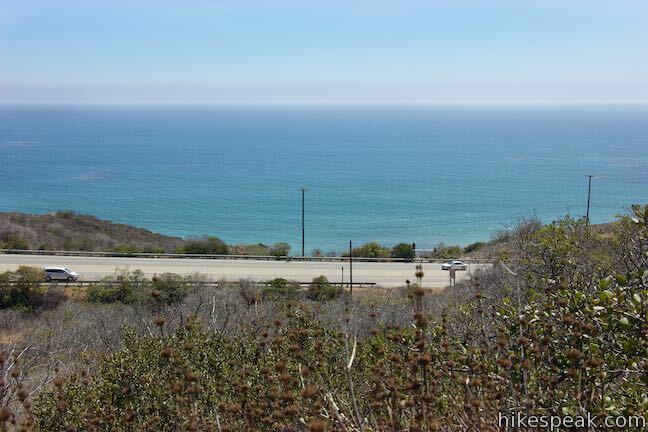 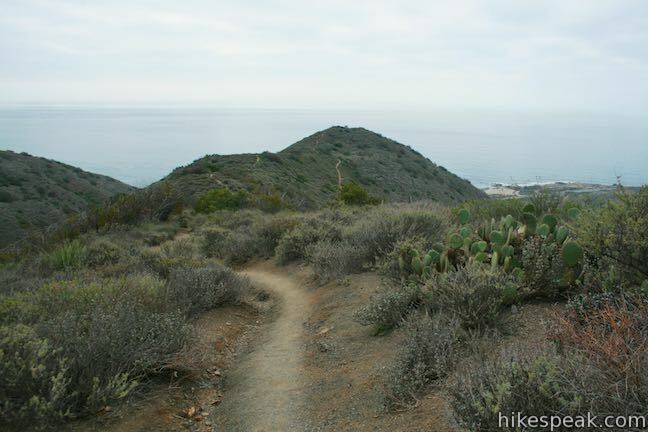 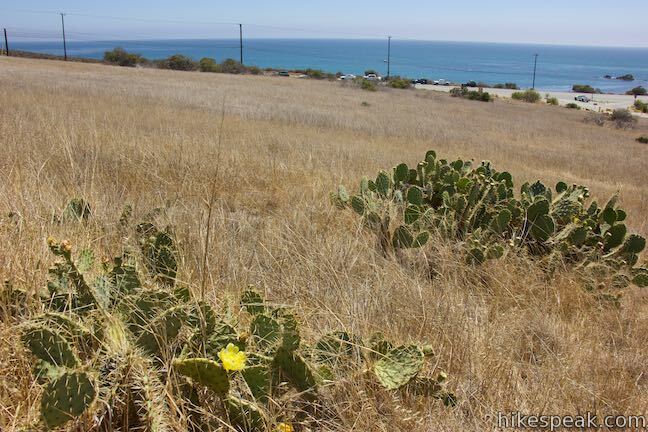 Nicholas Flat Trail is a three-mile long ‘ocean to mountains’ trail beginning within Leo Carrillo State Park, just across PCH from a famous beach at the west end of Malibu. 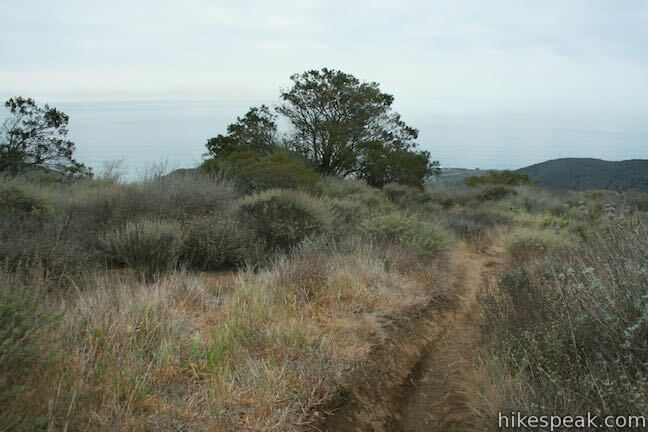 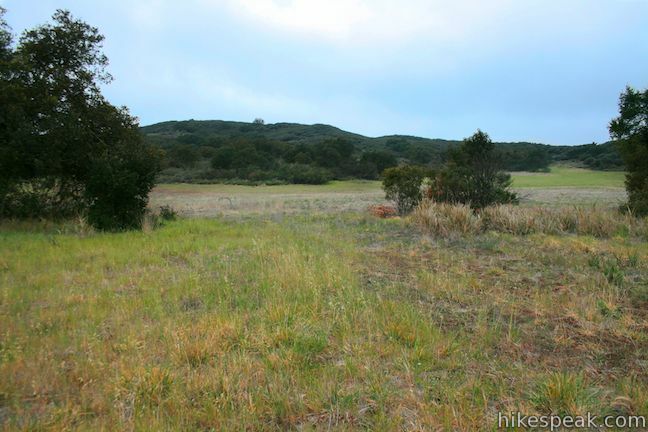 The single-track trail travels up a coastal ridge past two vista points (and lots of other ocean views) to reach Nicholas Flat, where grassy meadows are rimmed by oak trees. 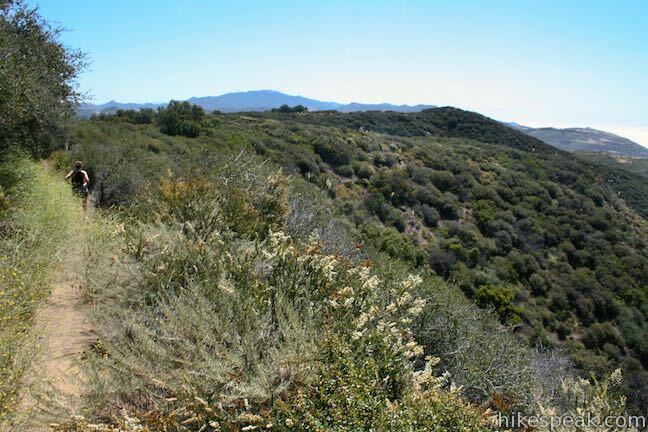 A small network of trails offer different routes through Nicholas Flat Natural Preserve. 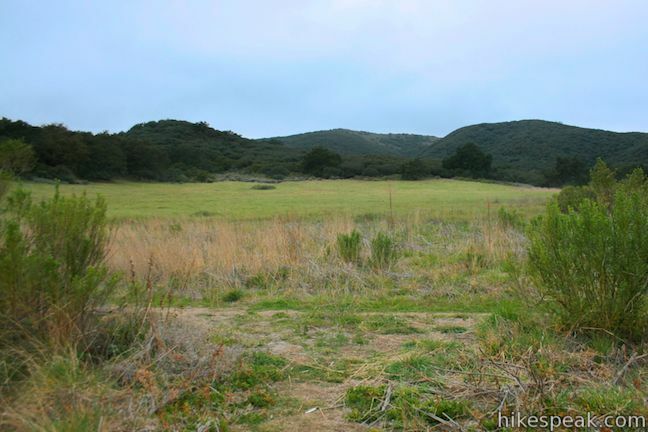 Meadows Trail and Pond Trail can be used to create a loop off the end of Nicholas Flat Trail that reaches a small man-made pond. 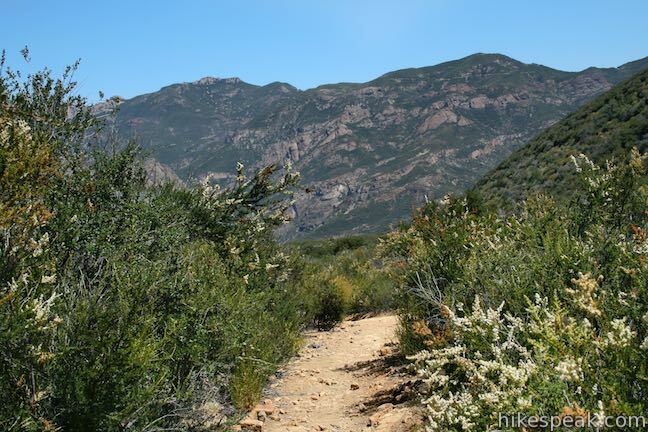 The hike up Nicholas Flat Trail to the pond and back is 7 miles round trip with 1,685 feet of elevation change. 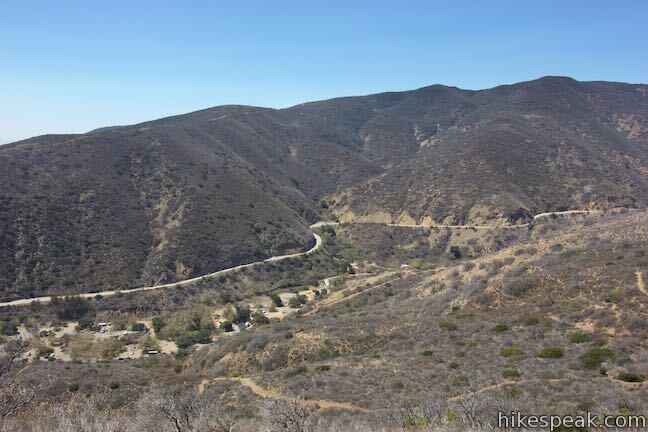 A couple more loops can be added to this hike, along with the two overlook spurs, to stretch the outing to 7.6 miles round trip with 1,745 feet of elevation change. 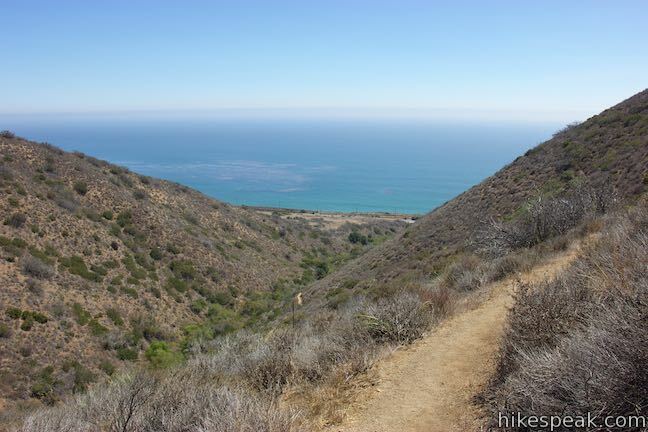 If you prefer something shorter, consider Nicholas Flat Trail – Willow Creek Trail Loop, which cuts the climb off at the first ocean vista for a 2.05-mile outing. 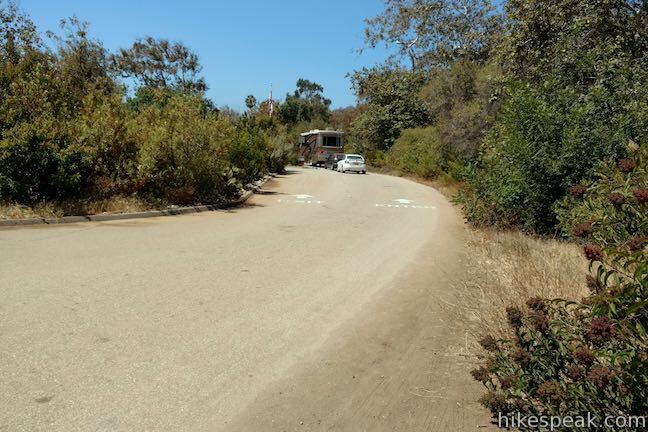 Set out from the day use parking area at Leo Carrillo State Park, which is just off Pacific Coast Highway near the intersection of Mulholland Highway. 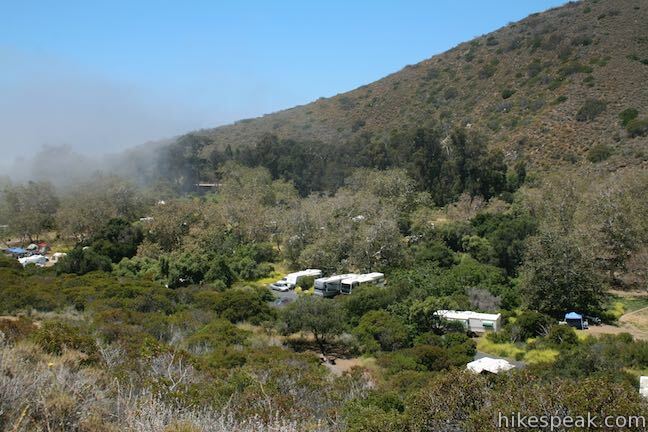 The day use lot is between the park campground and its popular beach. 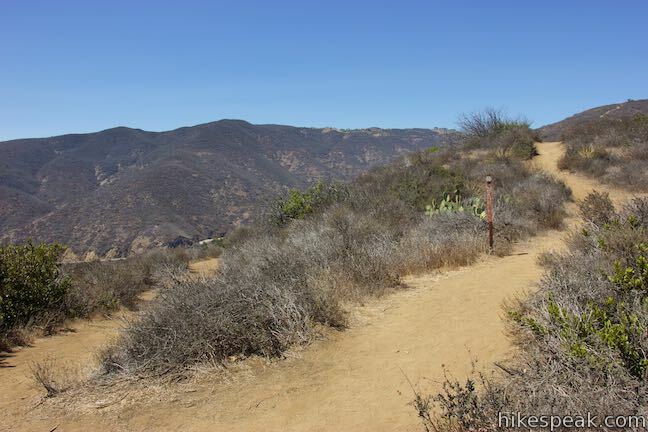 To find the trailhead, walk northeast toward the park entrance to find the signed start of Camp 13 Trail on the opposite side of the road into the park. 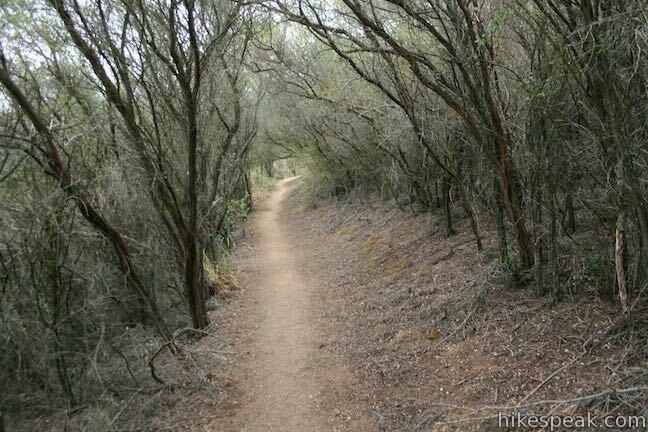 This trail is 0.6 miles long and passes along the east side of the campground. 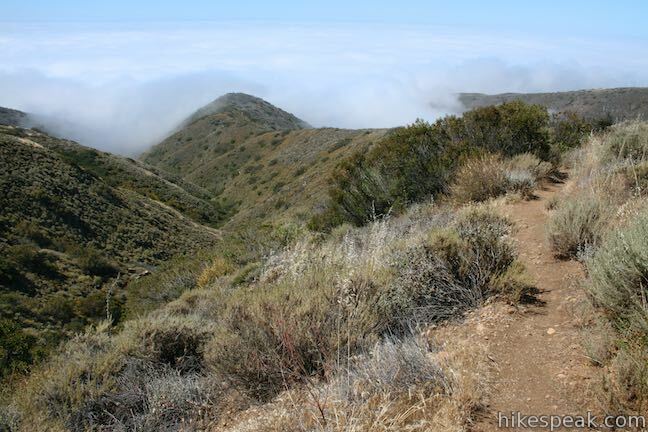 More importantly, it reaches the start of Nicholas Flat Trail after just 0.05 miles. 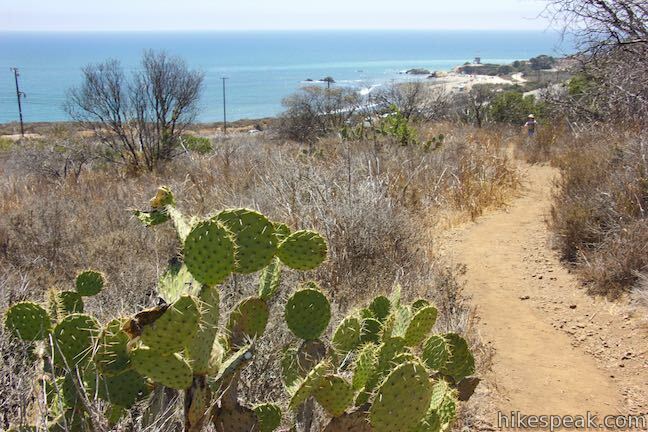 Hike up Camp 13 Trail to an information kiosk at the early junction. 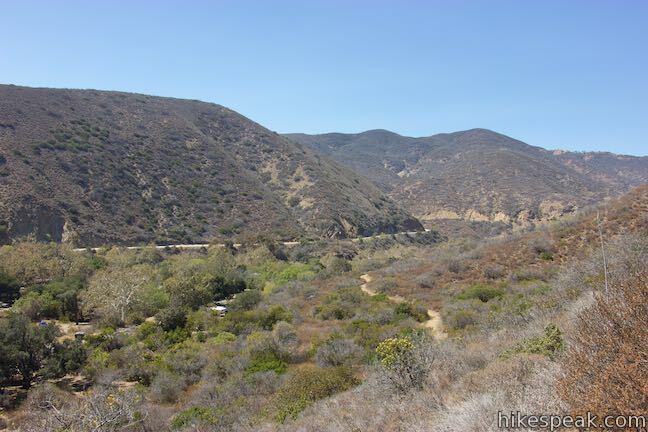 On the far left is the unmarked continuation of Camp 13 Trail. 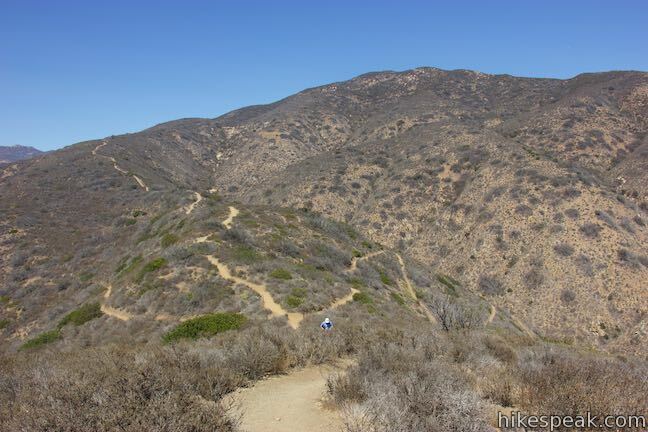 The other two trails are marked. 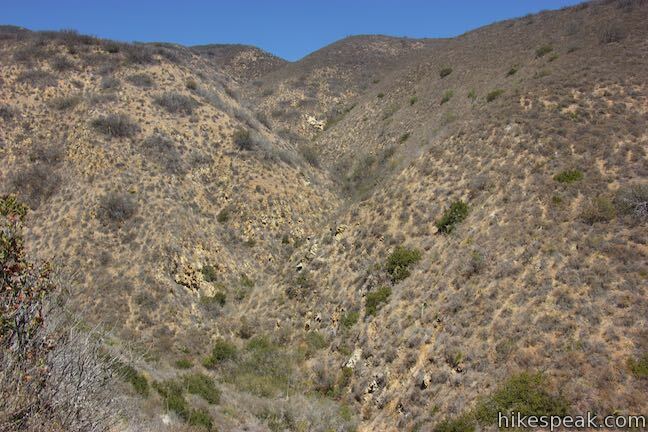 Nicholas Flat Trail ascends to the left and Willow Creek Trail is to the right, wrapping around the end of the ridge in front of you before ascending the smaller canyon on the far side. 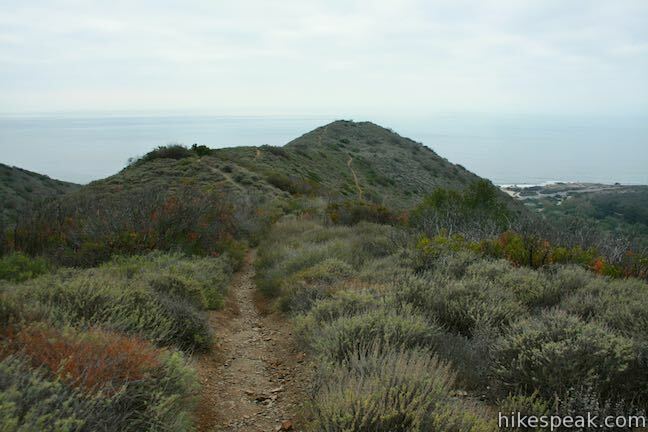 These two trails meet on top of the ridge next to a spur to the Ocean Vista, allowing them to be used to form a nice short loop. 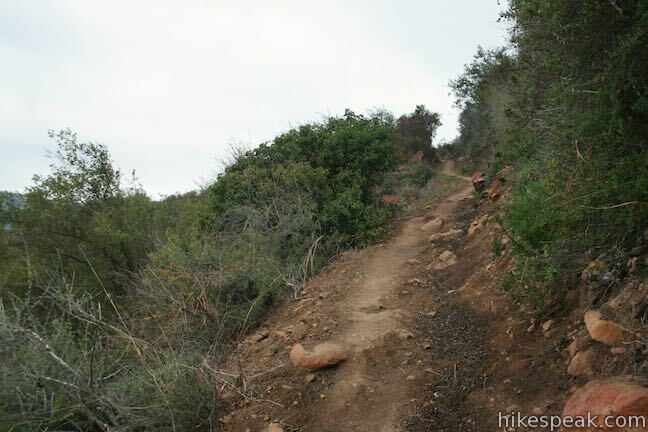 Willow Creek Trail can also be used a a slightly longer alternative to the first section of Nicholas Flat Trail. 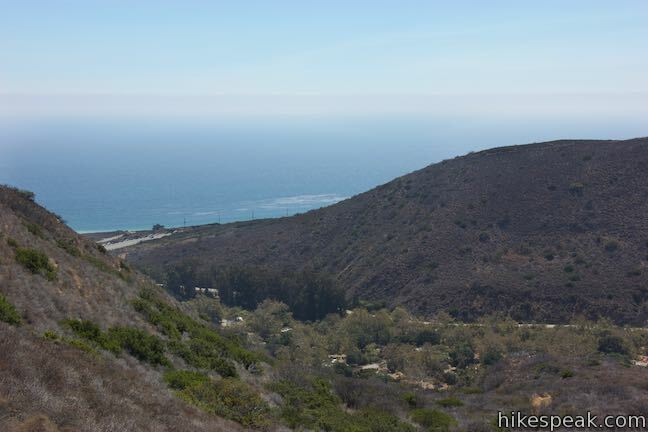 This write-up will save Willow Creek Trail as an option for the descent, when the ocean views are head-on, but you could begin up Willow Creek Trail as well. 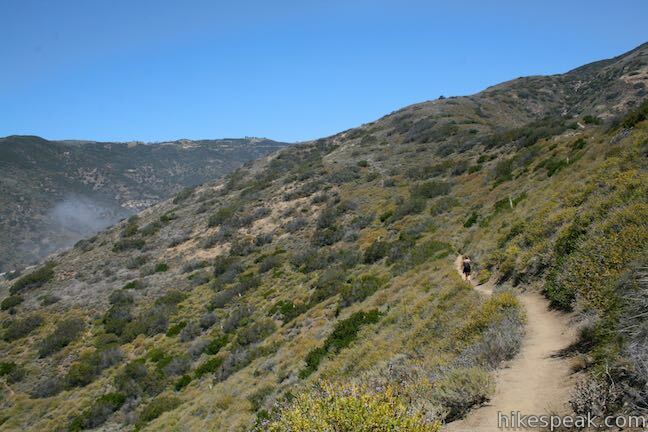 Leaving the kiosk, Nicholas Flat Trail heads north, slowly rising above Camp 13 Trail and the campground in Leo Carrillo State Park. 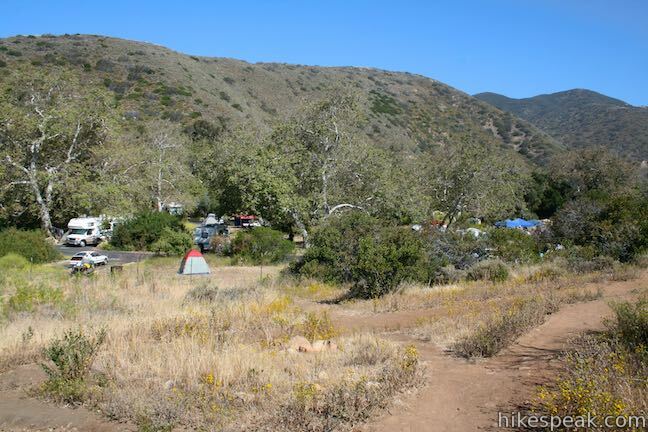 The campground is stretched out along the bottom of a broad canyon carved by a creek called Arroyo Sequit. 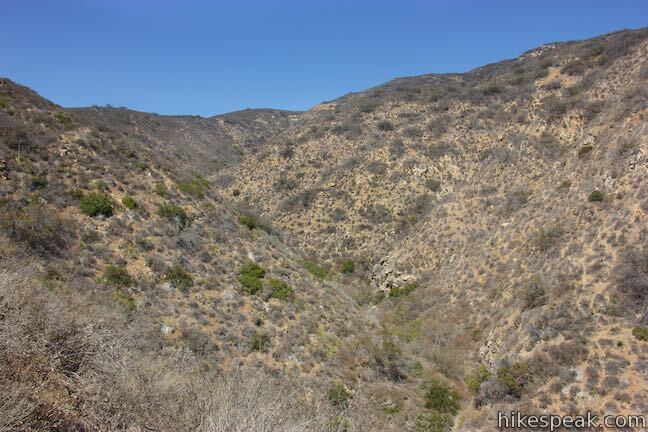 Beyond the sycamore-shaded campground you’ll see Mulholland Highway traveling along the side of the opposing ridge. 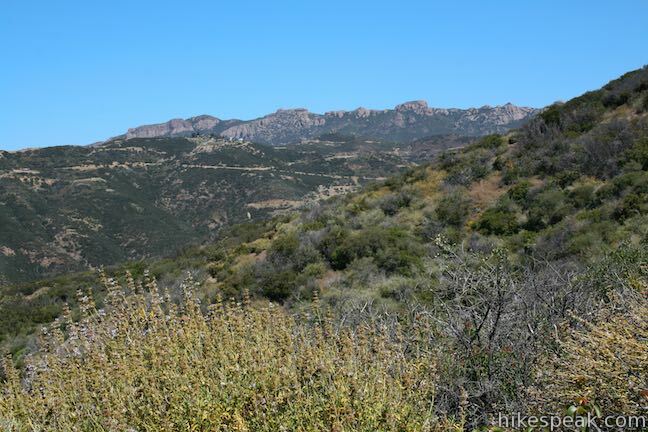 After 0.3 miles, Nicholas Flat Trail rounds a draw in the terrain and continues up the side of the ridge through chaparral. 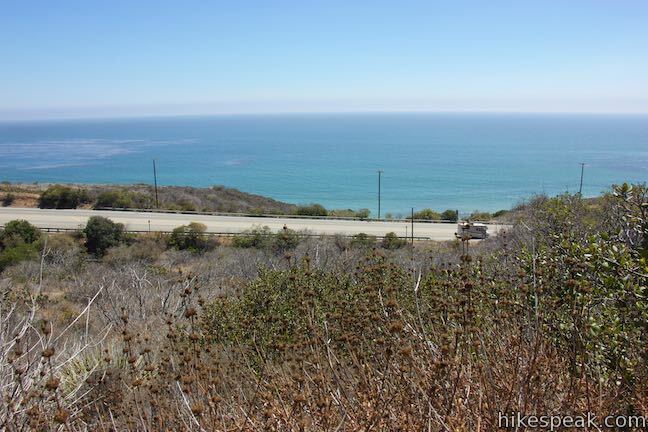 On the far side of the draw, you are positioned for nice views looking out the end of the canyon toward the ocean. 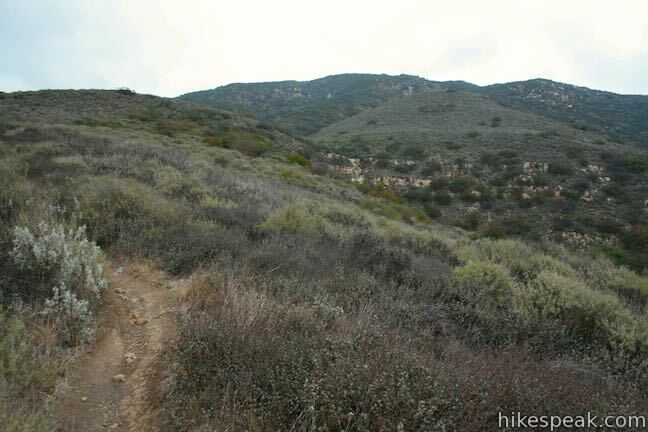 The single track then makes its way up a tapered area on the side of the ridge with a couple wide switchbacks. 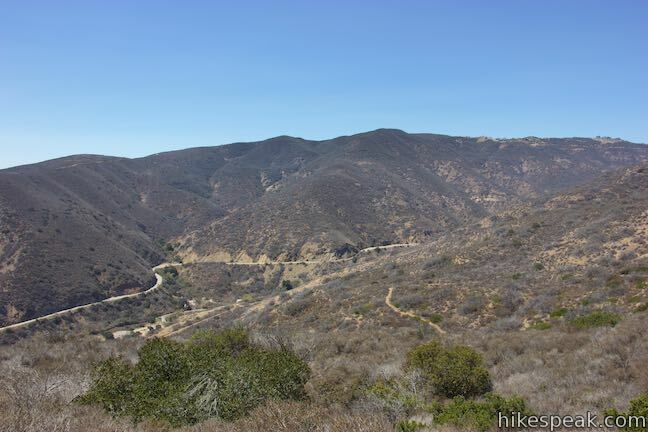 Eventually, Nicholas Flat Trail doubles back to the south and rises to a marked 4-way junction, 0.9 miles up Nicholas Flat Trail and 0.95 miles from the trailhead. 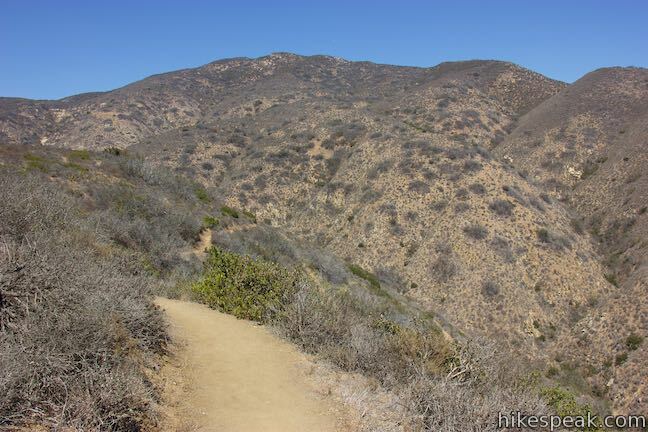 Nicholas Flat Trail continues to the left, following the broad ridge top from this point on. 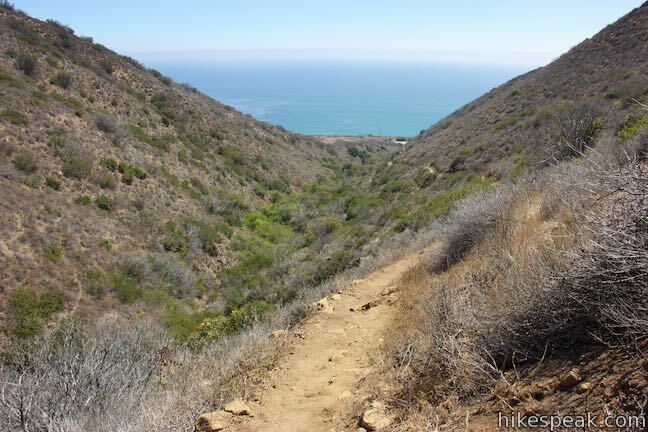 Straight ahead, Willow Creek Trail drops down the opposite side of the ridge. 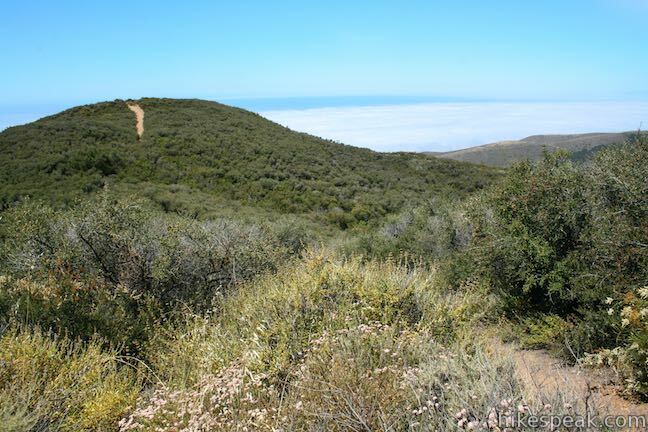 To take a break from Nicholas Flat Trail, bear right on a 300-foot long spur to Ocean Vista. 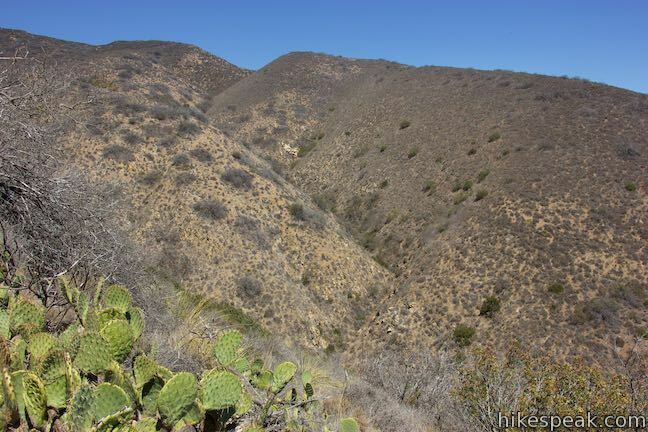 The short spur gains 45 feet as it rises to the crest at the end of the ridge. 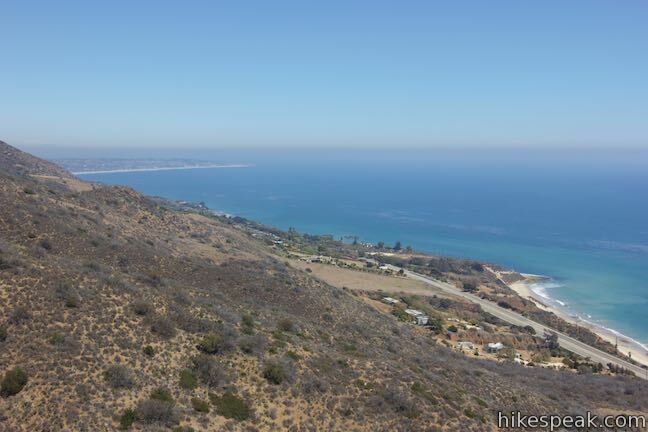 This bump has big view out over the ocean. 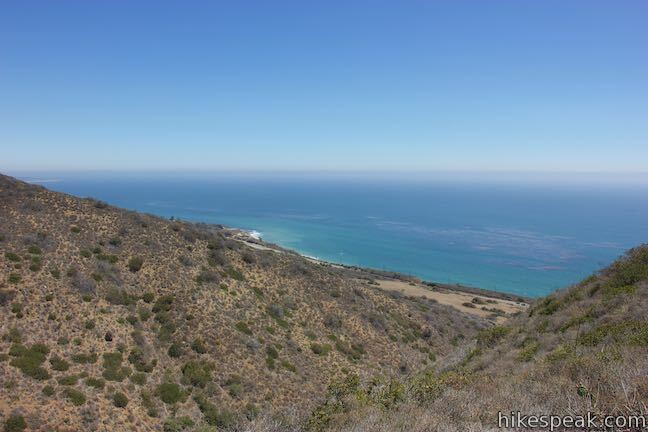 Look south down the coast toward Point Dume or watch waves wash in toward the beach below. 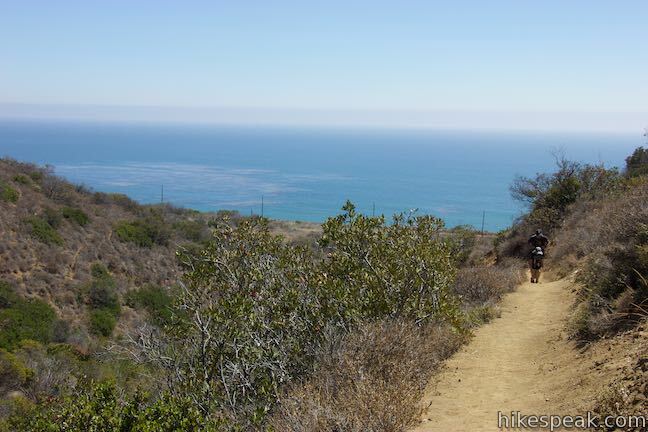 Once you’ve enjoyed the ocean view, return to the junction and proceed straight onto the next section of Nicholas Flat Trail (originally a left turn). 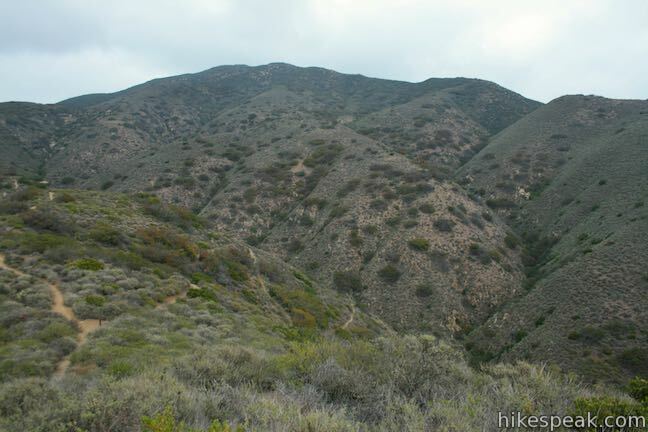 Nicholas Flat Trail sticks with the top of the rounded ridge as it ascents toward Nicholas Flat, which is cradled by mountains that rises to the northeast. 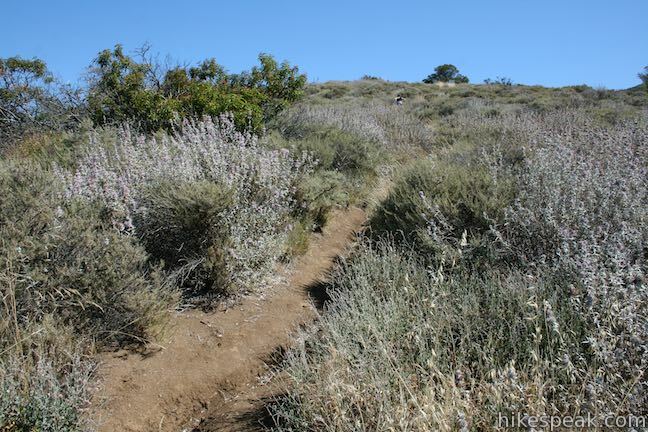 Purple sage dominants the short vegetation, providing unobstructed views of mountain and sea. 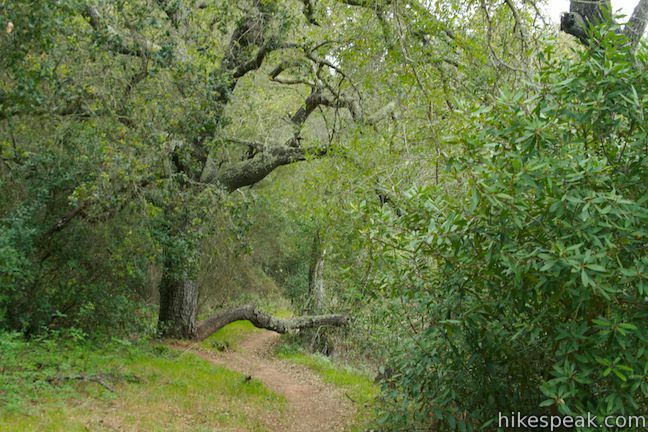 Shade is rare on Nicholas Flat Trail, but around half a mile from the junction, you’ll pass a short lone tree that casts just enough shade across the trail to warrant a quick break. 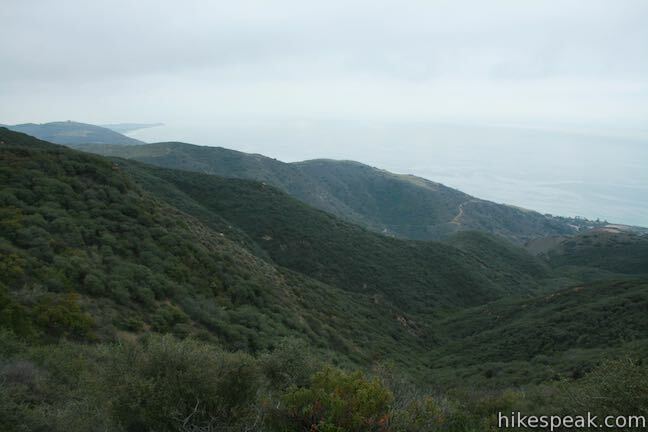 As you head farther inland, the views looking back down the ridge remain lovely. 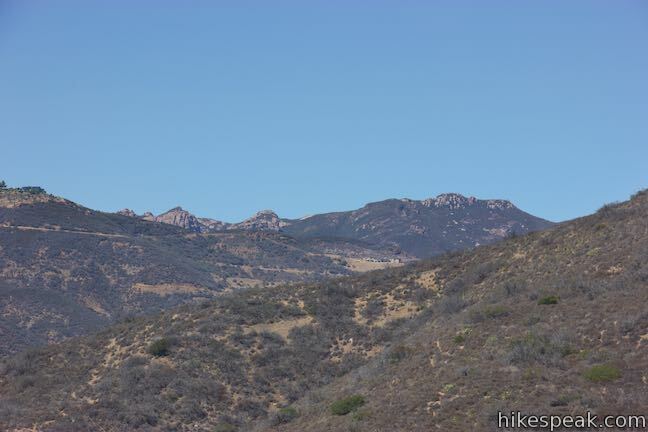 You will gain views to the northwest toward the Boney Mountains, a formation of bedrock-exposed mountains that includes Sandstone Peak, the highest summit in the Santa Monica Mountains. 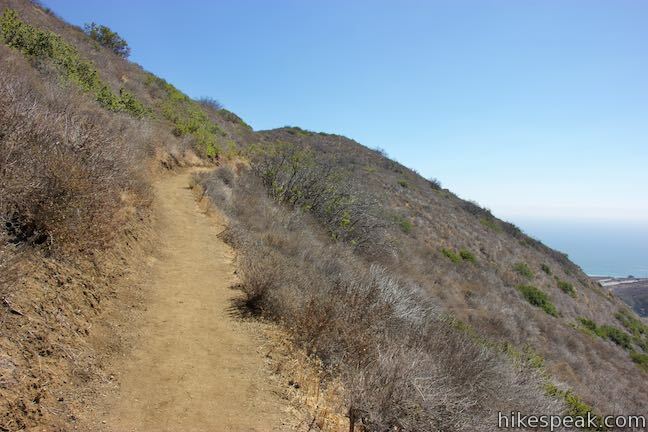 Make your way through a couple switchbacks and ascend to some taller brush that arches over the trail, about 2.1 miles from the start. 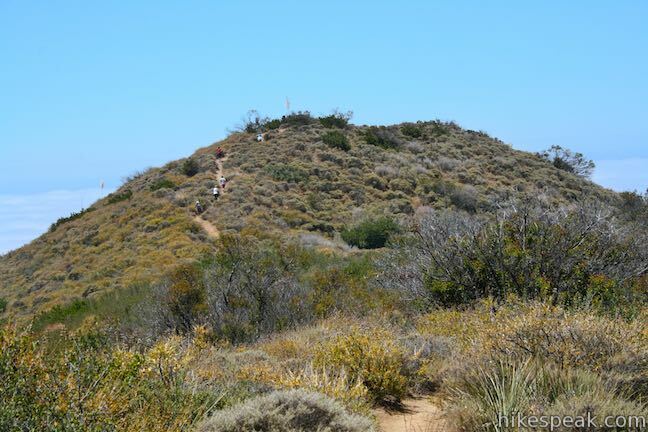 Keep pushing up the trail and you will soon cross its highest point at 1,705 feet. 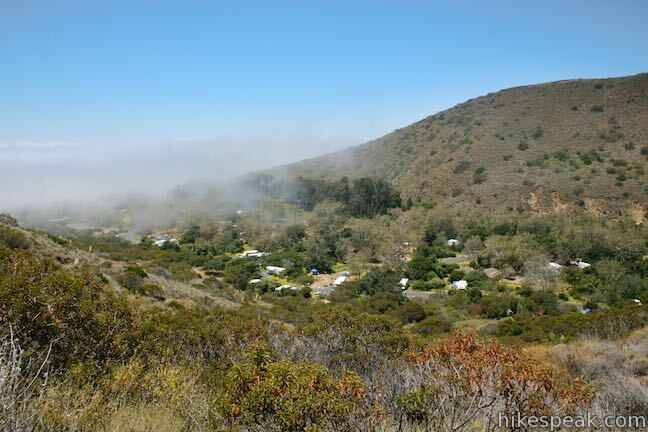 Things taper out as you approach at T-junction, 2.45 miles from the start. 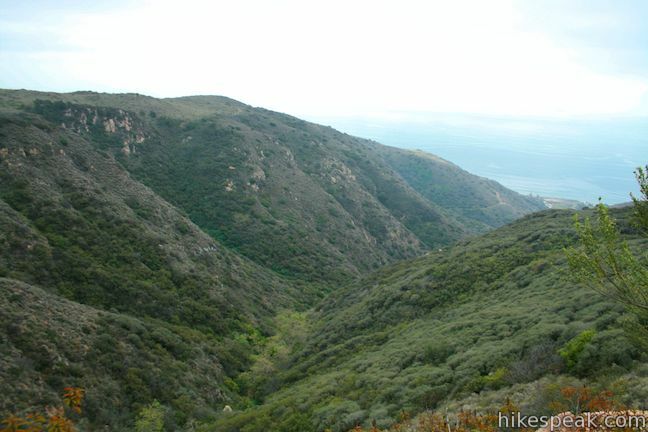 The left fork at the T is the continuation of Nicholas Flat Trail. 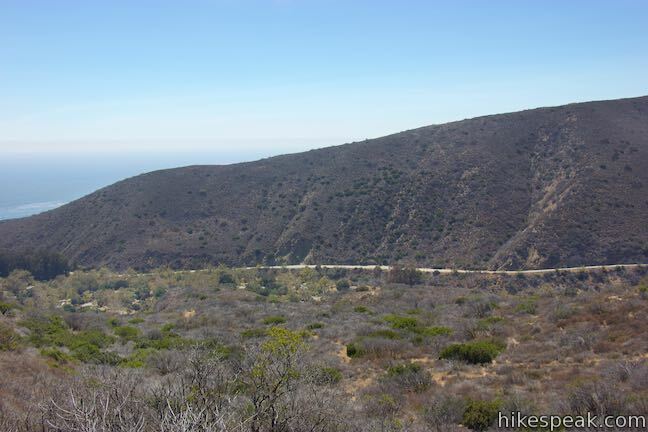 If you like extra ocean views, bear right to take a short, 400-foot long spur out to a mini-summit that has a survey marker and nice views toward the ocean and the Boney Mountains. 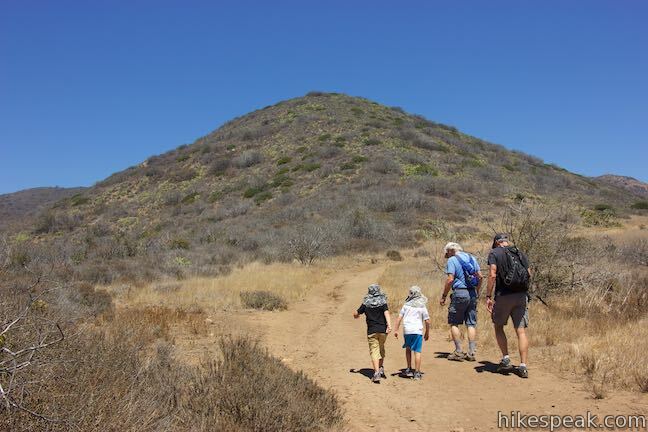 This quick addition gains 40 feet of elevation and bumps up the total elevation for the hike to 1,720 feet. 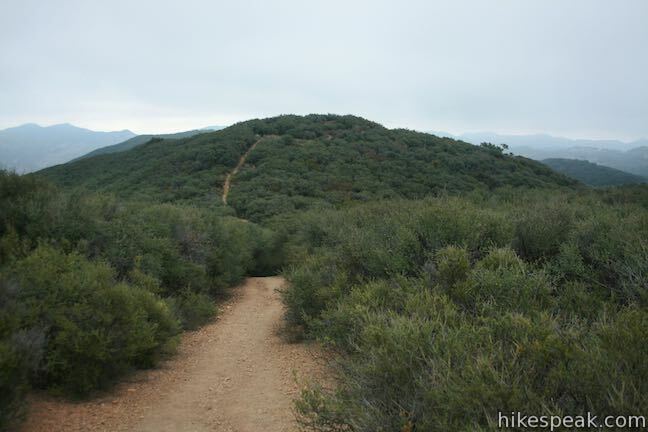 Proceed on Nicholas Flat Trail for a short distance to a marked junction with Ridgeline Trail. 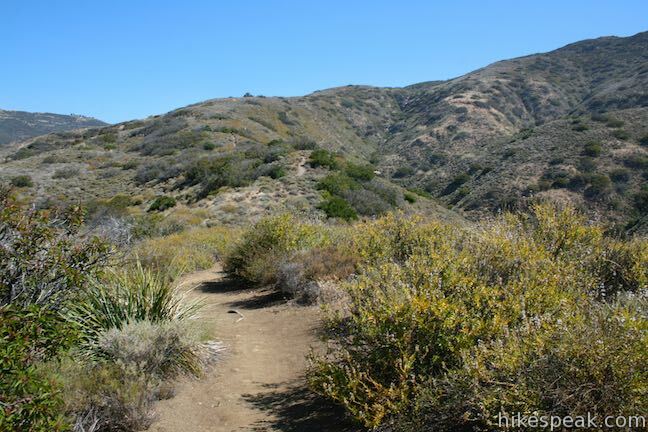 Ridgeline Trail connects to Malibu Springs Trail (an alternate route to Nicholas Flat) and Meadows Trail, which crosses Nicholas Flat and can be used to form a larger loop through its oaks and grasses. 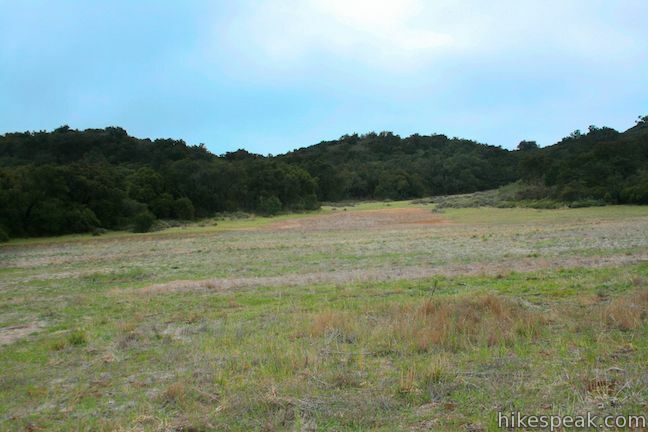 Bear right to stick with Nicholas Flat Trail. 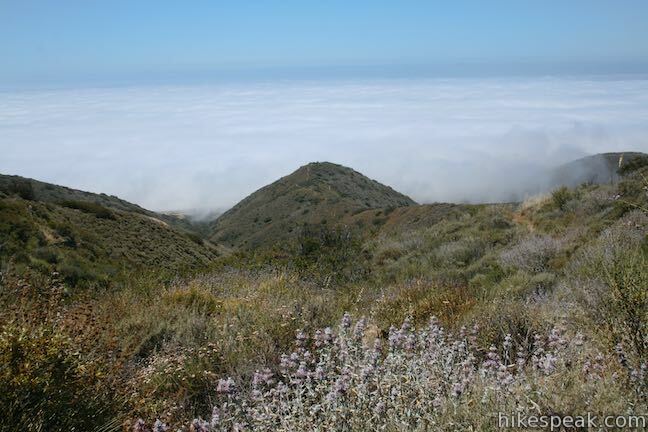 As you continue into the last half-mile of Nicholas Flat Trail, you’ll be treated to broad views to your right looking down ridges and canyons toward the Pacific Ocean. 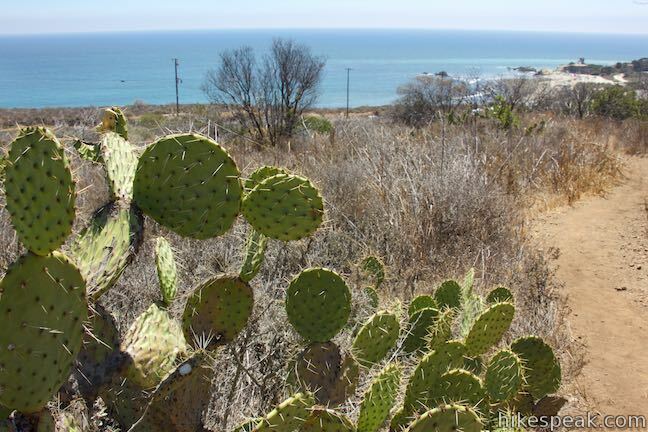 This is a beautiful coastal landscape that feels far removed from the hustle and bustle of Los Angeles. 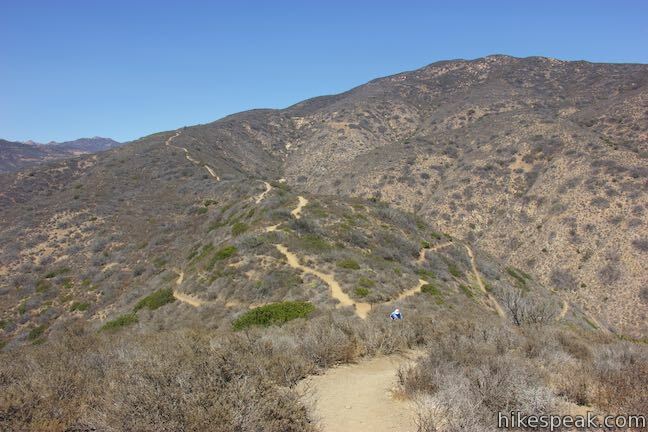 In another tenth of a mile, stay the course through a junction with a connector trail that parts to the left and meets up with Ridgeline Trail. 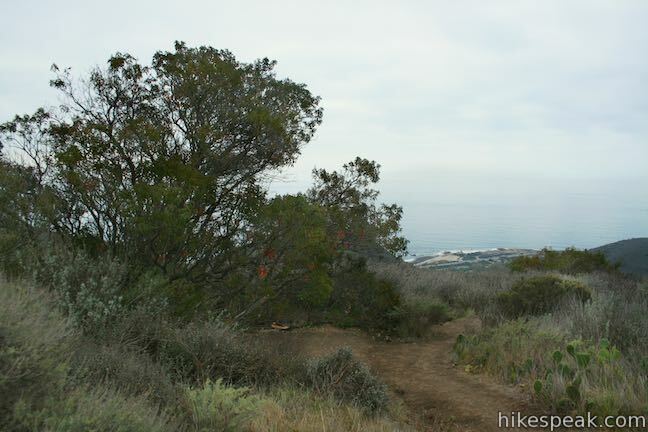 Nicholas Flat Trail dishes out more ocean views before curving to the left. 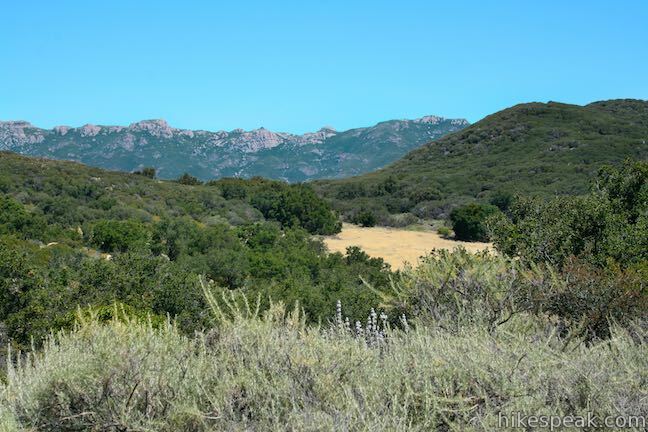 Stay to the left through a spur and gradually descend through oaks to a meadow on Nicholas Flat. 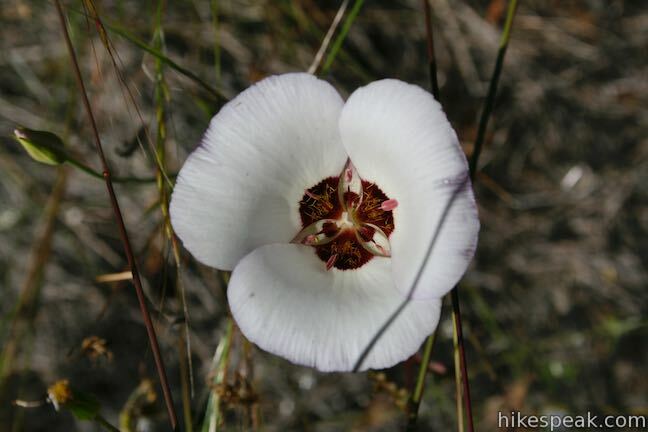 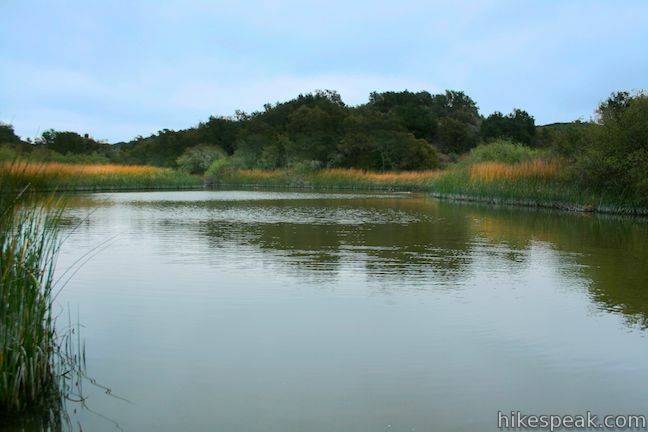 This is a quiet, peaceful retreat and a good place to observe wildlife and admire spring wildflowers. 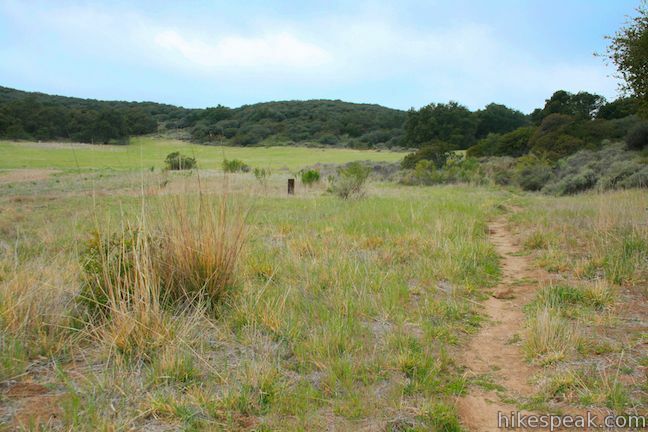 Look out over grasses to your left as you approach at T-junction at the end of Nicholas Flat Trail, 3 miles from the start. 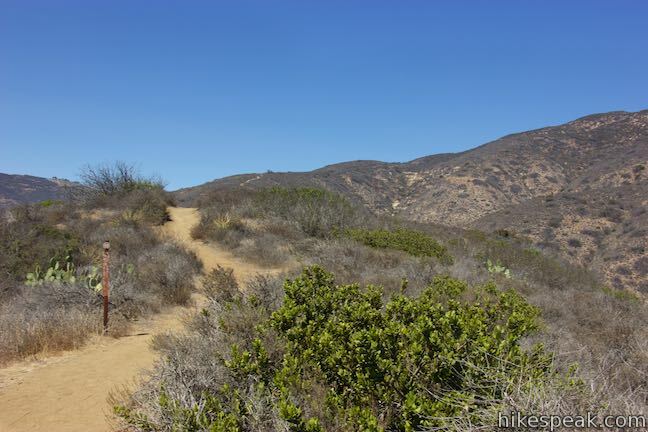 Meadows Trail heads in two directions. 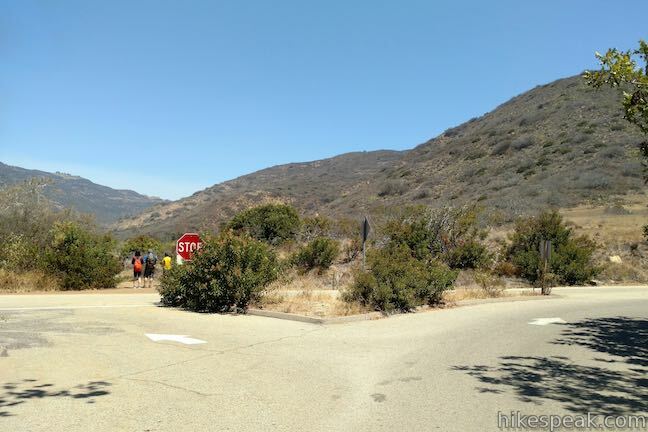 To find the loop to Nicholas Pond, turn right. 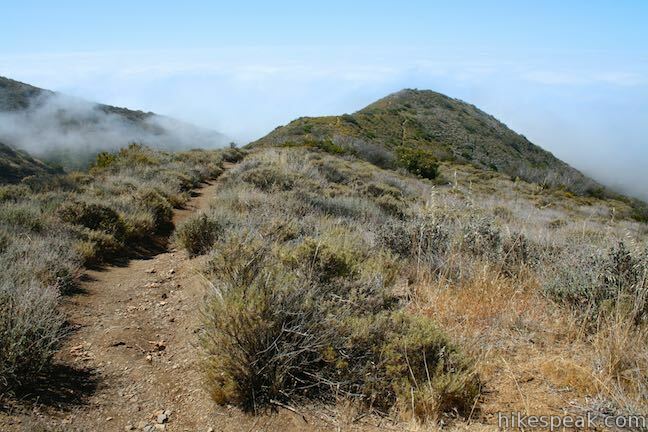 To the left, Meadows Trail crosses the north side of the flat to link up with Ridgeline Trail. 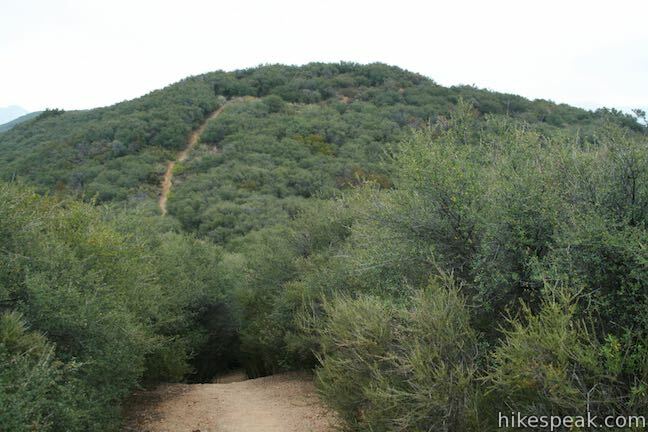 This half of Meadows Trail can be used to add a second loop to the hike, which is described below as an alternate return route. 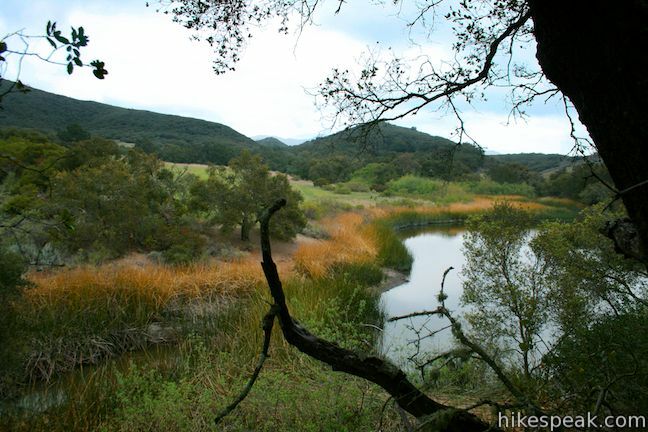 Turning right to hike east on Meadows Trail, you will immediately come to a split where the loop to Nicholas Pond begins. 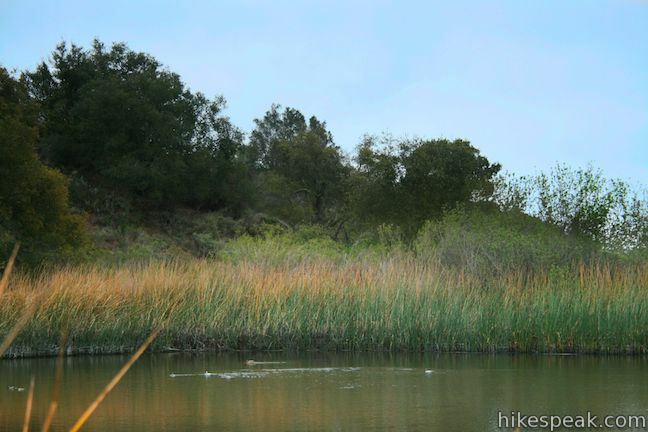 Pond Trail breaks off to the right and offers the most direct line to Nicholas Pond. 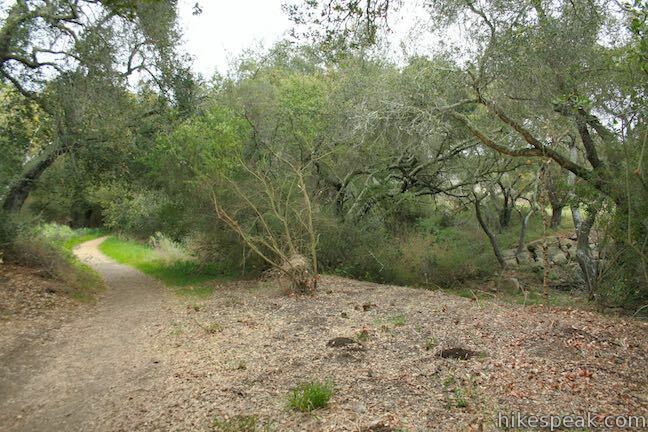 To see more of the area’s offerings, continue straight on Meadows Trail, which swings to the left and then to the right as you travel east through a lovely grove of coast live oaks. 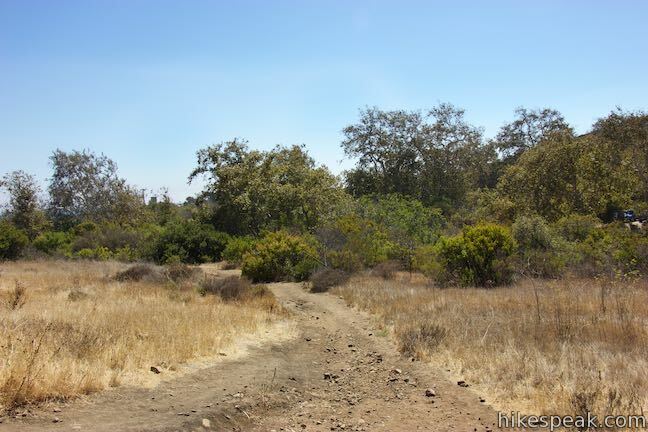 At 0.3 miles from the start of the loop, you will hit the end of Meadows Trail at a T-junction with a dirt section of Decker School Road. 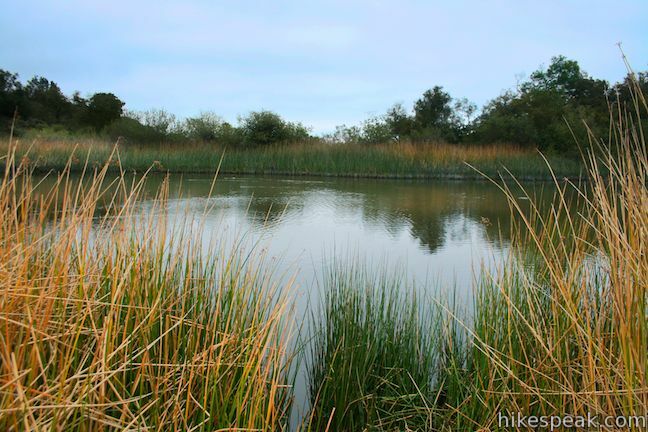 Turn right and hike along a creek that flows into Nicholas Pond for the last 0.2 miles, finding the reed-lined shore of a man-made cattle pond. 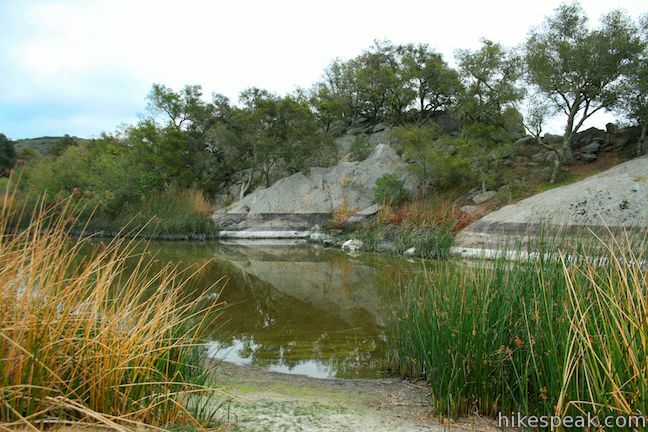 Livestock no longer uses the pond and ducks have taken up ownership, lazily floating across this rare pool in the Santa Monica Mountains. 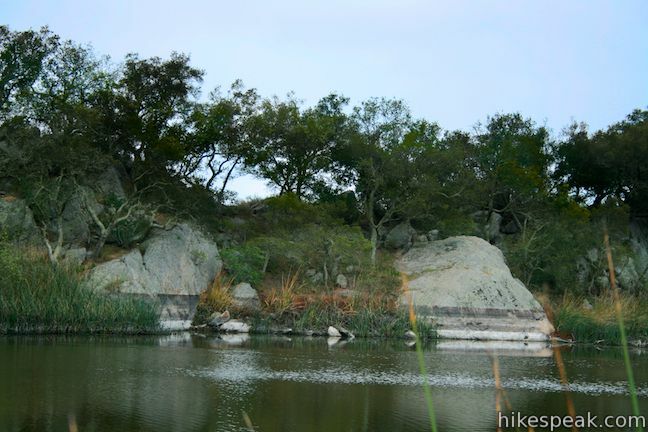 Oak trees and a wall of boulders border Nicholas Pond on its south side. 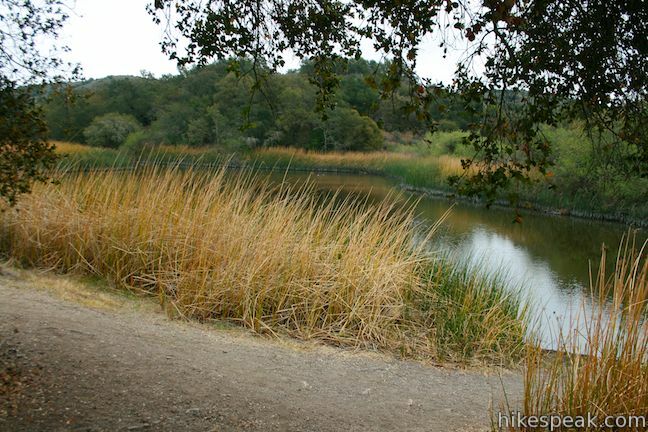 Walk west around the pond to a welcoming pair of shade-providing oaks, perfectly positioned beside the bank of Nicholas Pond. 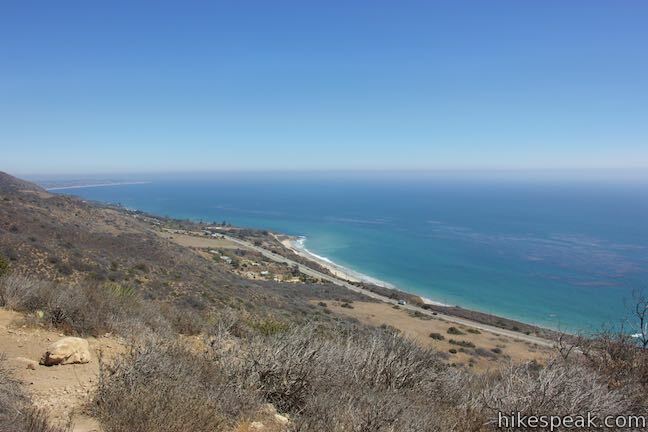 Take a break here and recharge from the hike up. 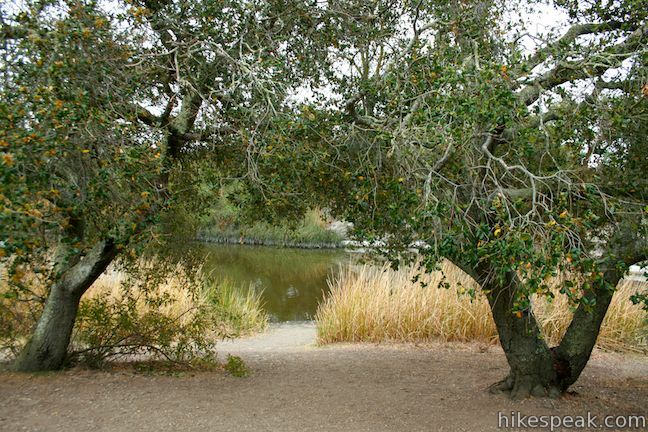 When you are ready, walk past the oaky pair to a path that wraps around the pond to the ridge on the south shore. 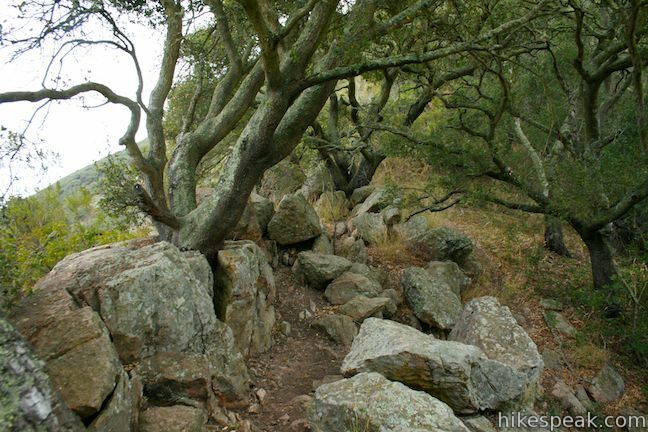 If you venture out across the boulders in this area, watch out for the abundant poison oak. 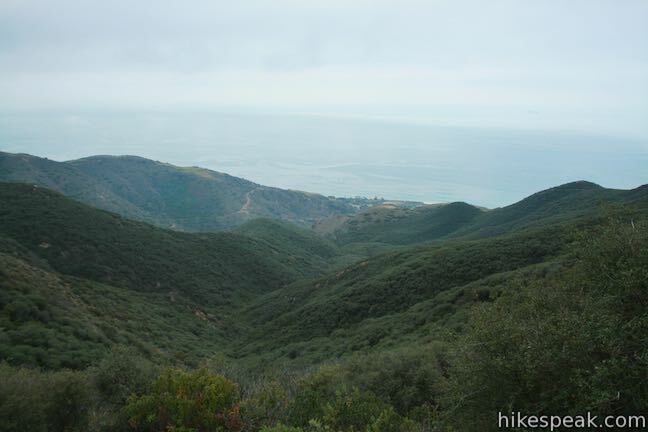 The reward for the risk is a dramatic view south down Nicholas Canyon, which drops 1,400 feet to the Pacific Ocean. 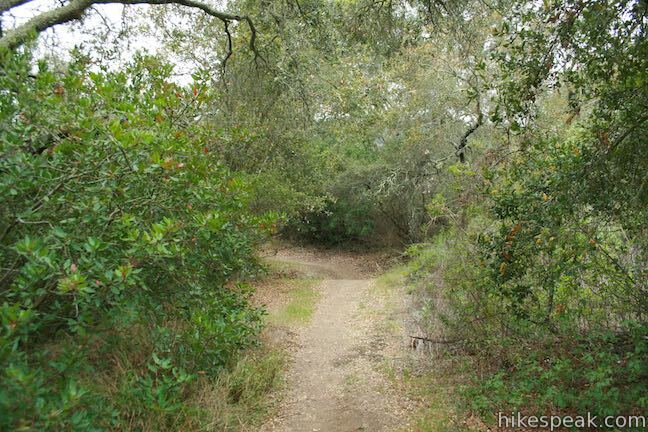 Closer to the two oaks next to Nicholas Pond, you’ll find the other end of Pond Trail, which is unmarked. 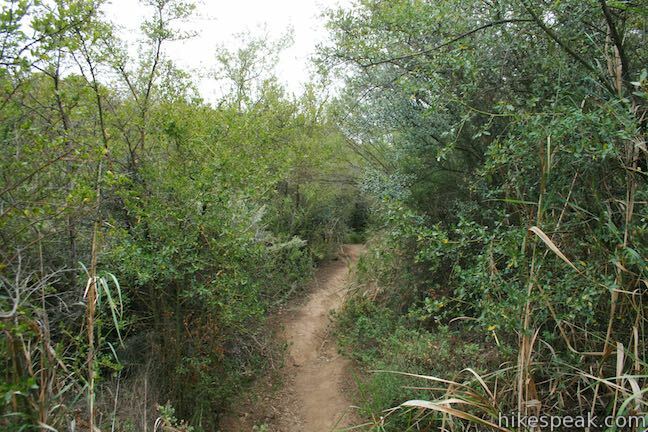 This trail heads northwest away from the pond to reconnect you with Meadows Trail. 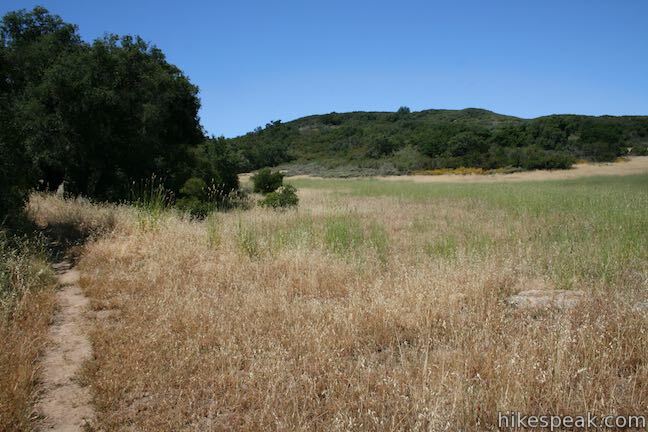 Over 0.3 miles, the single track passes through grasses and oaks for a great sampling of Nicholas Flat. 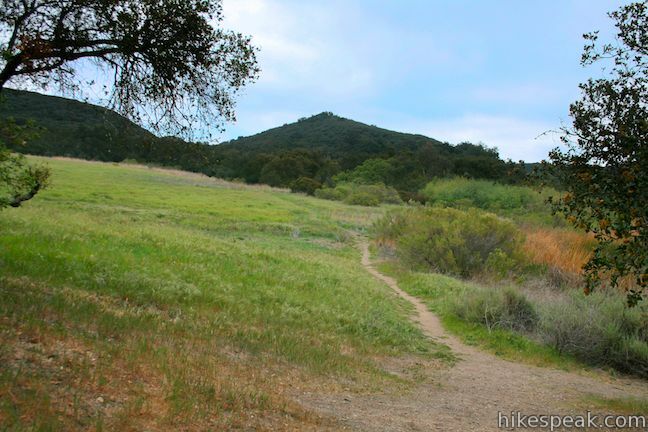 Turn left onto Meadows Trail and walk just a hundred feet to reach Nicholas Flat Trail. 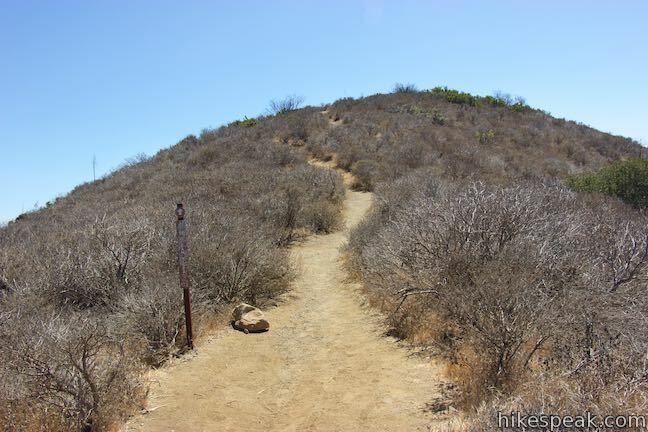 Turn left to hike down the way you came or consider hiking farther around Nicholas Flat. 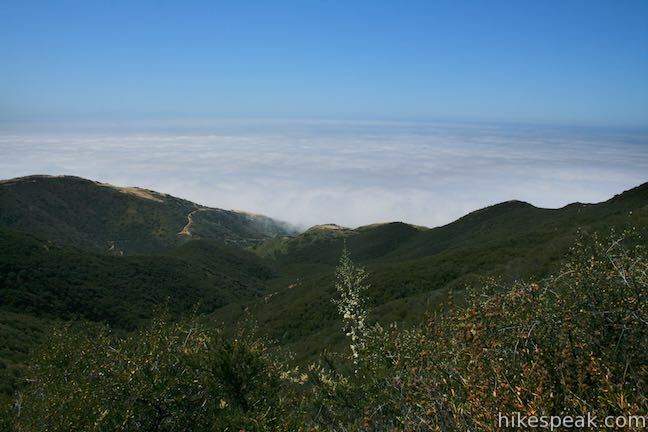 A couple additional loops can be added to the hike back from Nicholas Flat. 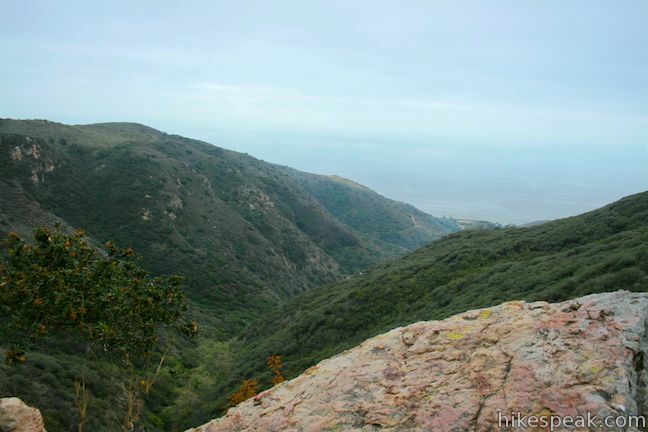 After completing the loop to Nicholas Pond, hike west on Meadows Trail through the junction with Nicholas Flat Trail. 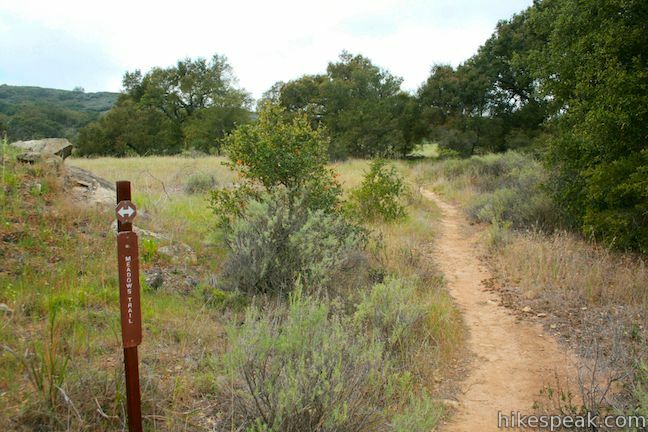 The single track crosses the northern border of the largest meadow on Nicholas Flat. 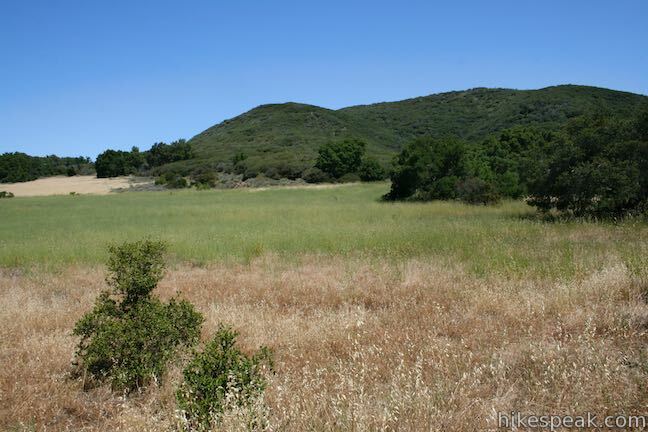 Look out across the grasses toward the round oak-covered hills that encircle this special parcel of the Santa Monica Mountains. 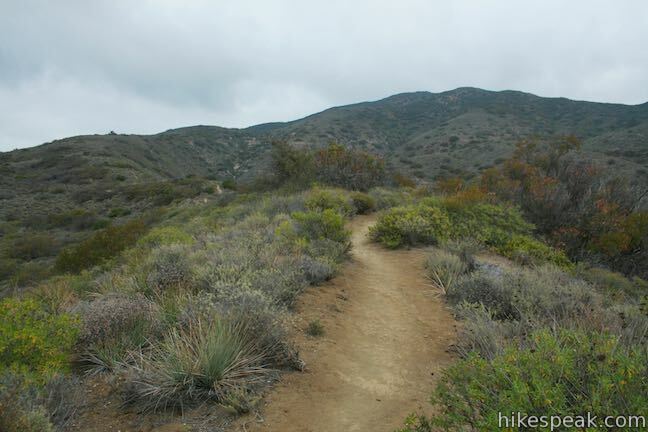 After a quarter mile, you will hit a junction with Ridgeline Trail. 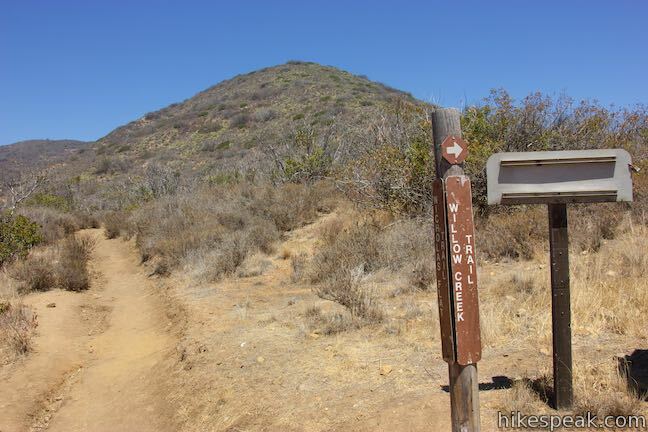 One branch of the trail, marked with a sign that reads to Malibu Springs Trail ascends to the right, and connects to Malibu Springs Trail to facilitate an up-the-backside route to Nicholas Flat with great mountain views. 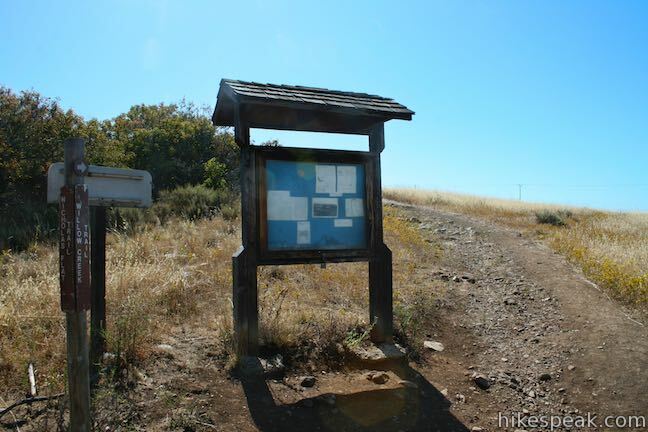 To reconnect with Nicholas Flat Trail, bear left on Ridgeline Trail. 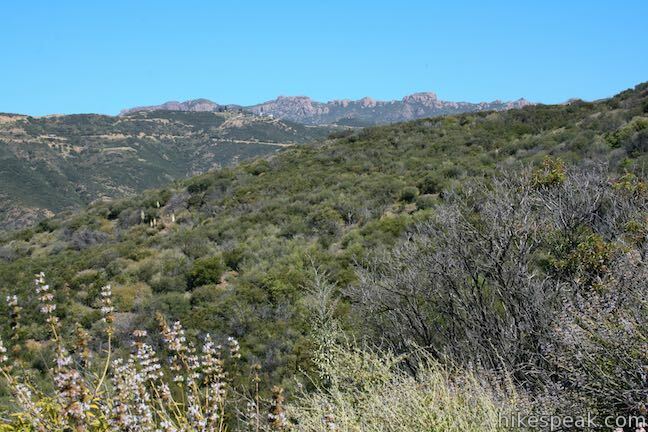 As Ridgeline Trail gets underway, you’ll make a sharp left turn and gather great views northeast toward the Boney Mountains. 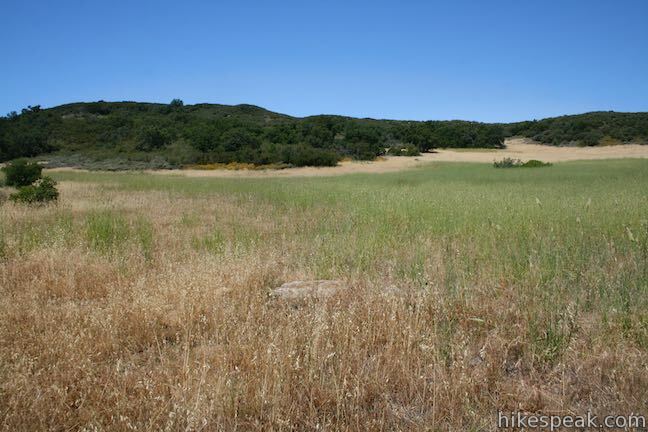 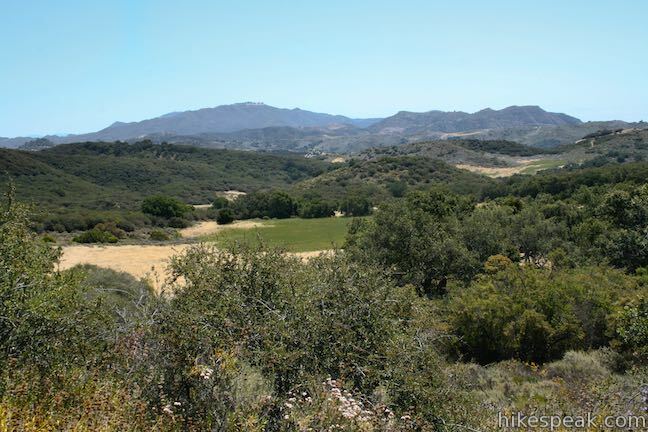 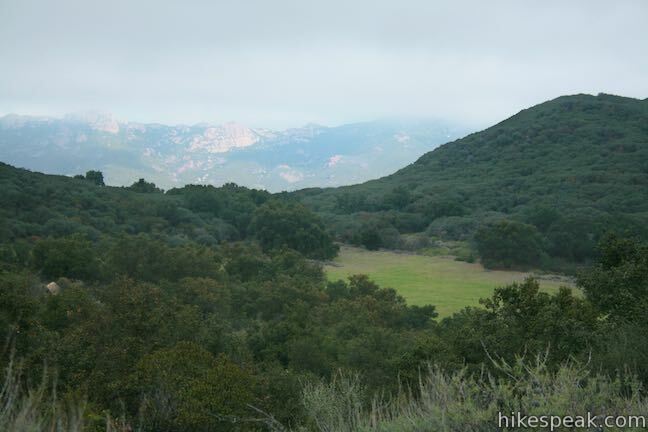 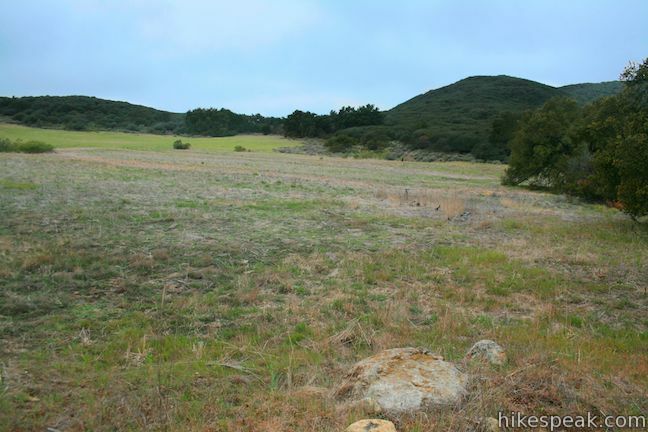 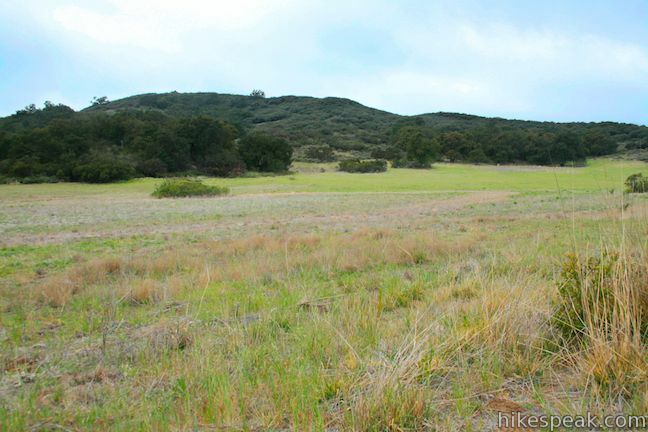 As you gain some elevation over the ridge on the west end of Nicholas Flat, you’ll get a commanding overview of the area you just explored, looking east across the meadow and oak-filled flat toward other peaks in the Santa Monica Mountains. 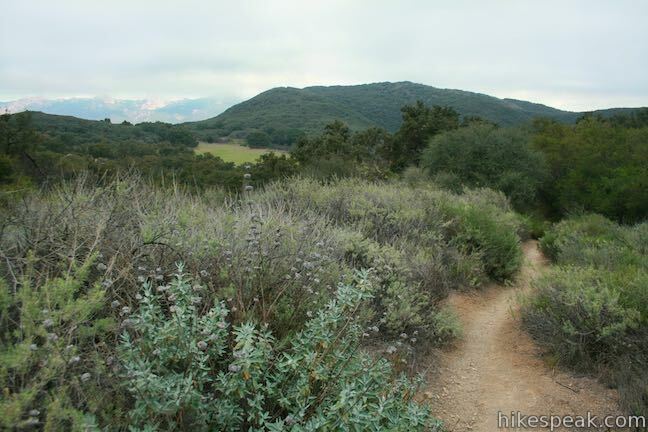 After 0.45 miles on Ridgeline Trail, you will meet the junction with Nicholas Flat Trail. 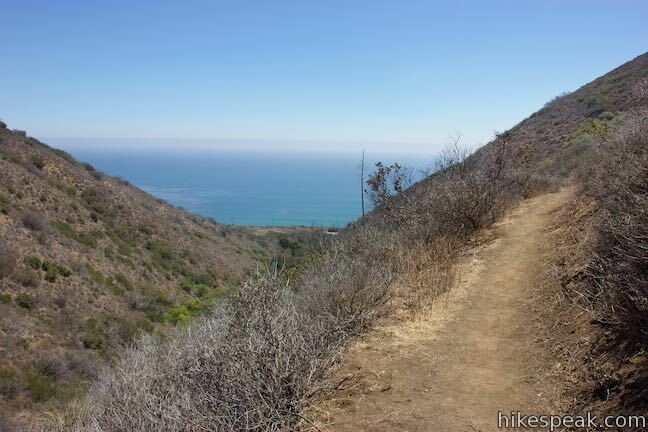 Bear right to hike 2.5 miles down to the entrance of Leo Carrillo State Park (making the next right at the spur to the viewpoint). 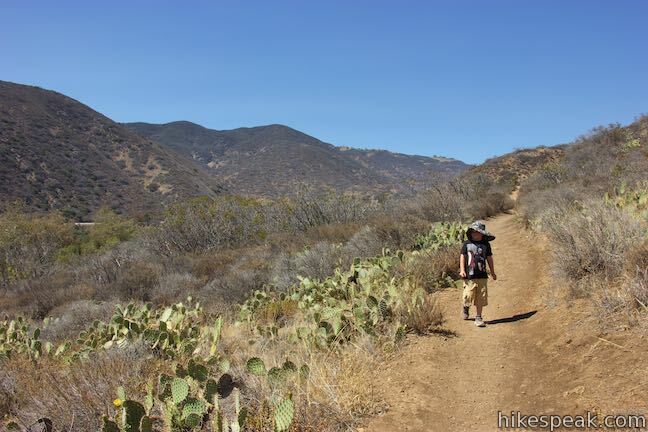 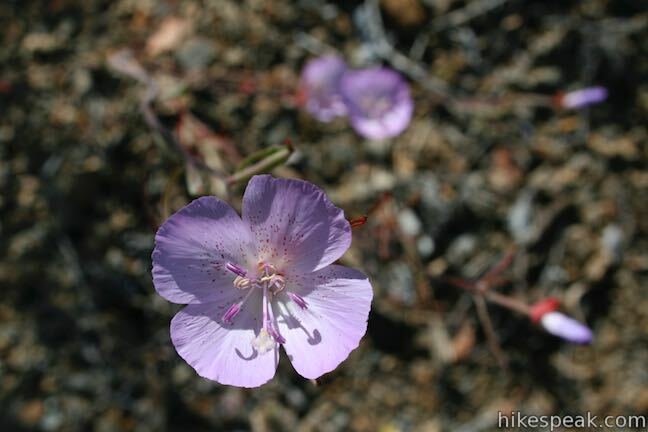 This combination of Meadows Trail and Ridgeline Trail replaces half a mile of Nicholas Flat Trail to form a loop that extends the hike by 0.3 miles and pushes up the total elevation change. 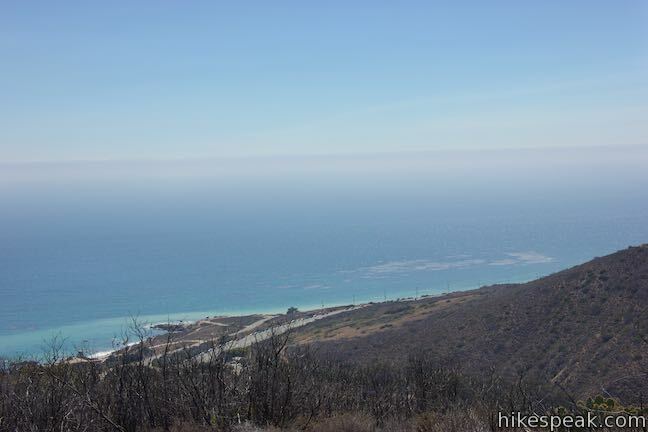 When you hike down Nicholas Flat Trail to the 4-way junction before the spur to Ocean Vista, you’ll be presented with another option to form a loop. 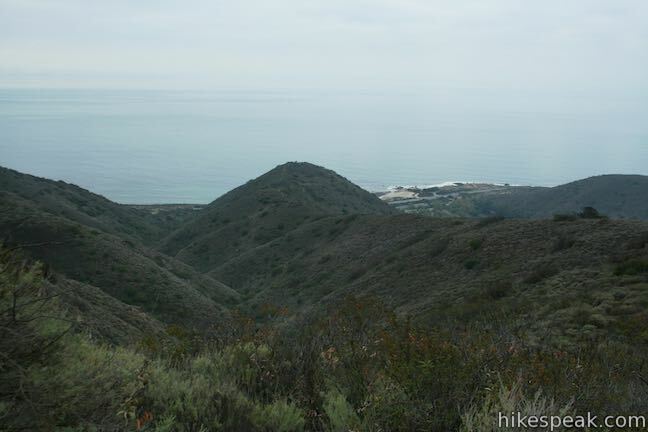 Nicholas Flat Trail proceeds down the campground side of the ridge to the right, but you can turn left down Willow Creek Trail to explore a coastal canyon with more ocean views. 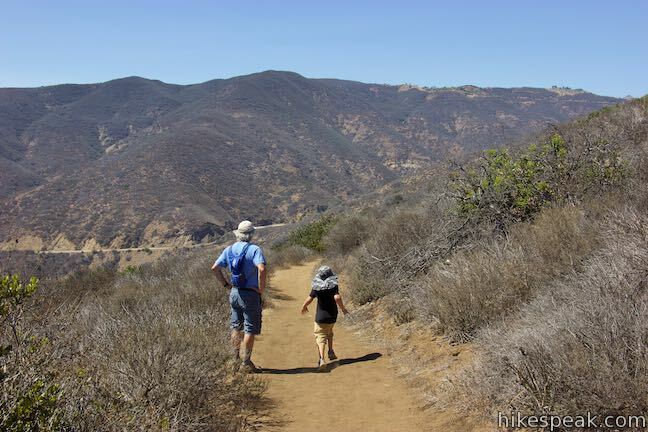 Taking Willow Creek Trail only adds 0.05 miles to the hike’s distance. 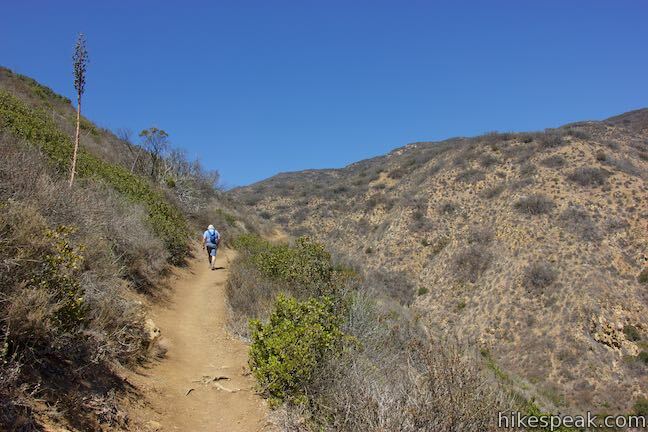 Willow Creek Trail begins with a trio of switchbacks leading down into a relatively narrow and rugged canyon. 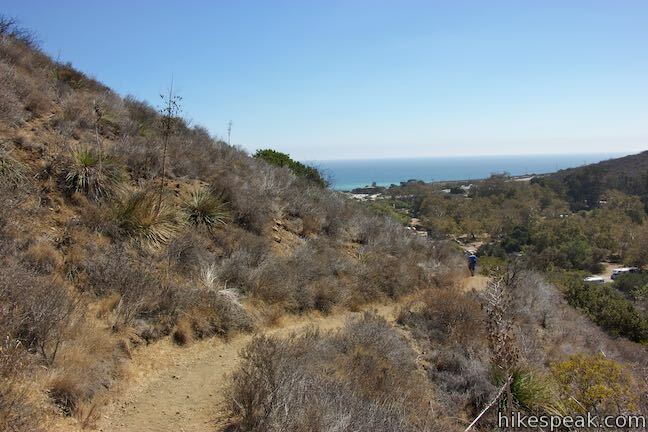 As you descend, you’ll have nice views across the canyon toward sandstone formations and up the mountainside you just explored. 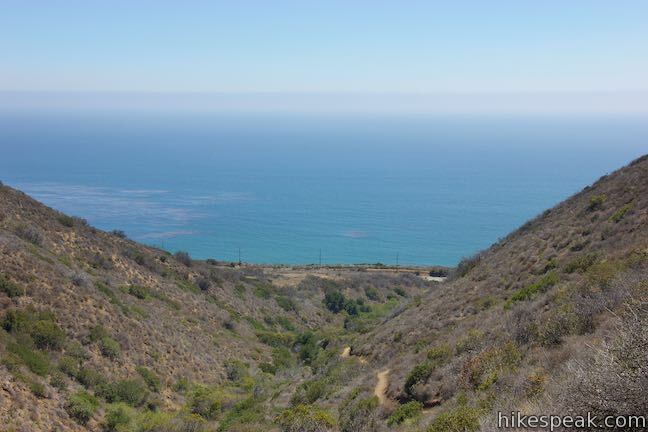 Once it gets straightened out, Willow Creek Trail points south toward the mouth of the canyon, lining you up for great ocean views. 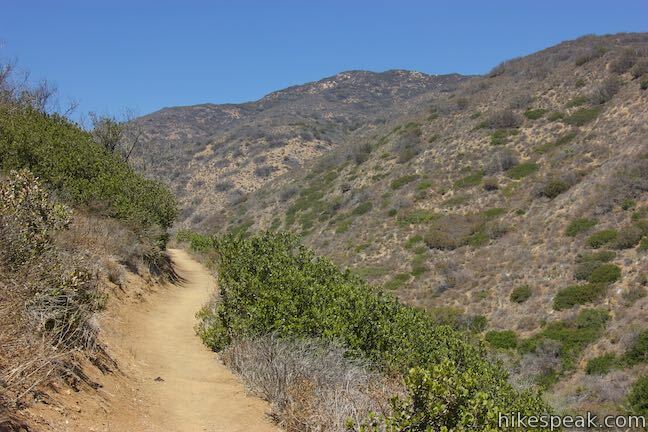 After 2/3 of a mile on Willow Creek Trail, the single track leaves the canyon and curves to the right around the end of the ridge. 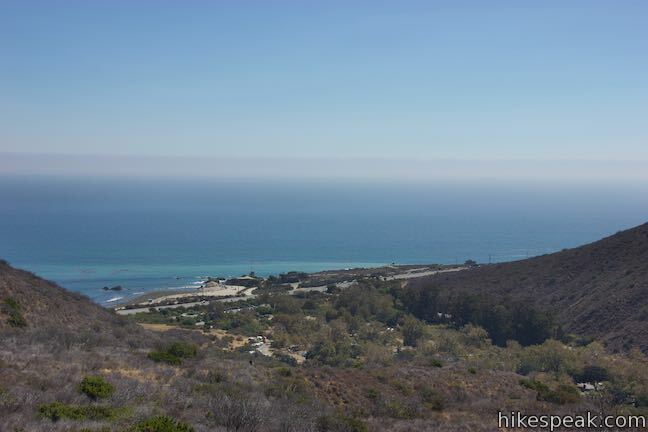 The ocean views are wide open from this point on as you descend gradually from 200 feet above sea level. 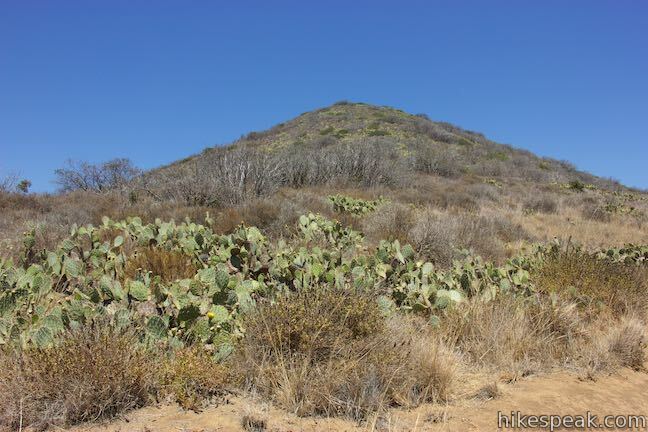 Pass through a few patches of prickly pear cactus as you wrap around the end of the ridge to return to the trail kiosk. 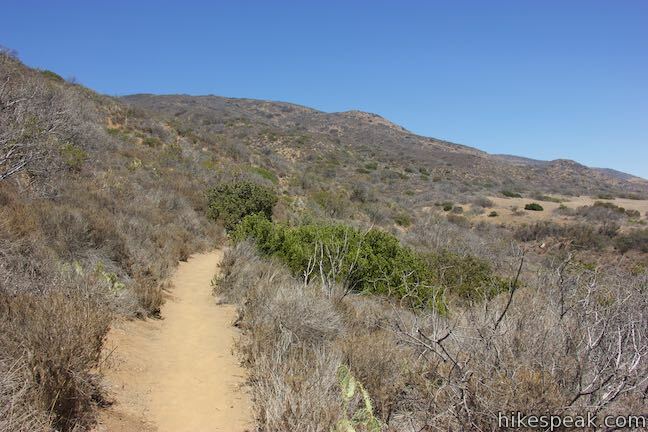 Turn left down Camp 13 Trail to hike back to the trailhead parking area to complete the hike. 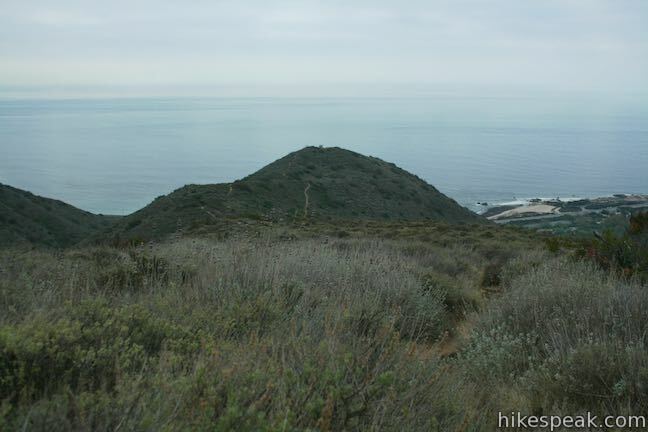 These two additions extend the hike to Nicholas Pond by 0.35 miles. 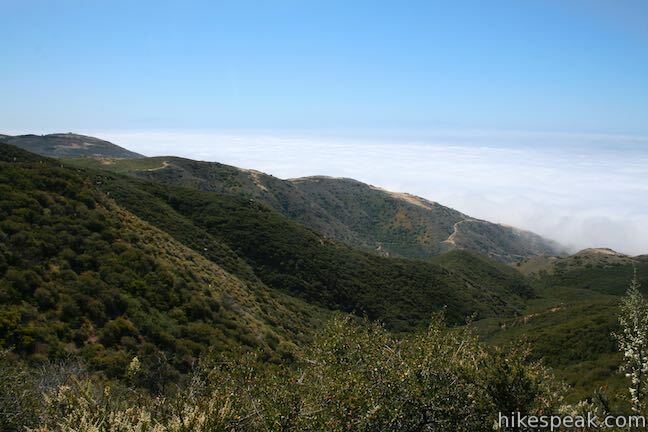 If you check out the two extra loops and the two overlook spurs, this hike will be 7.6 miles round trip with 1,745 feet of elevation change. 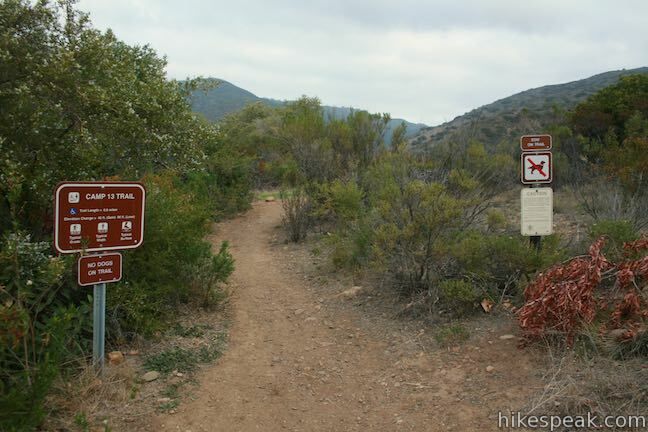 Dogs and bikes are not allowed on this hike in Leo Carrillo State Park and Nicholas Flat Natural Preserve. 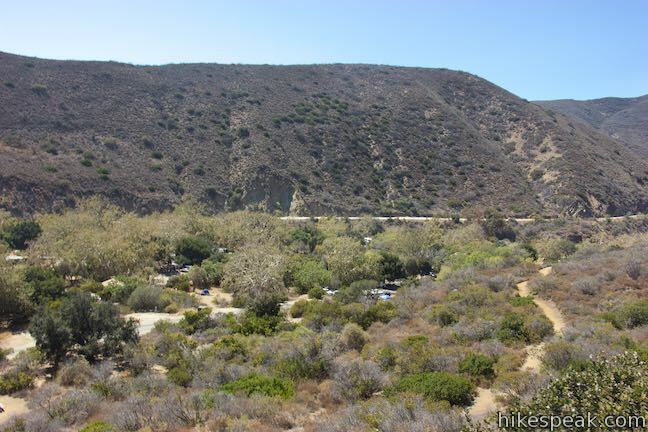 An entrance fee is required to park in the day use area (which is $12 per vehicle as of 2016). 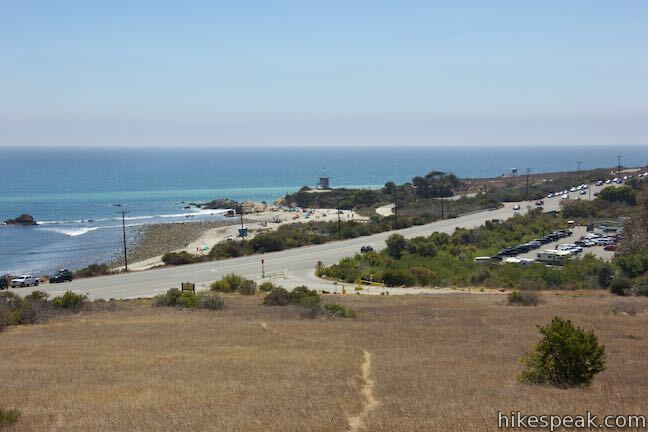 Free parking is also available along Pacific Coast Highway. 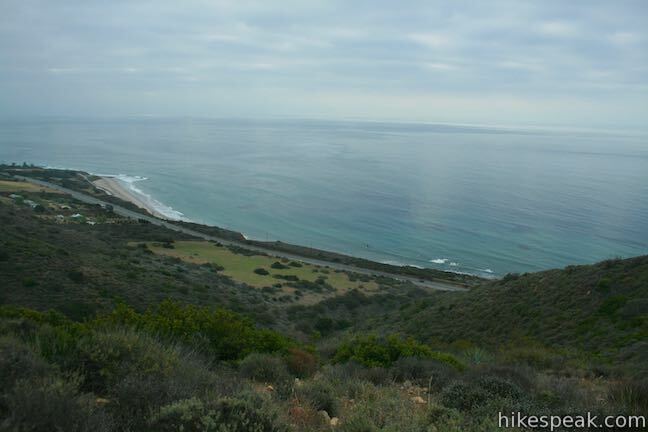 I just did this hike today and thoroughly enjoyed it. 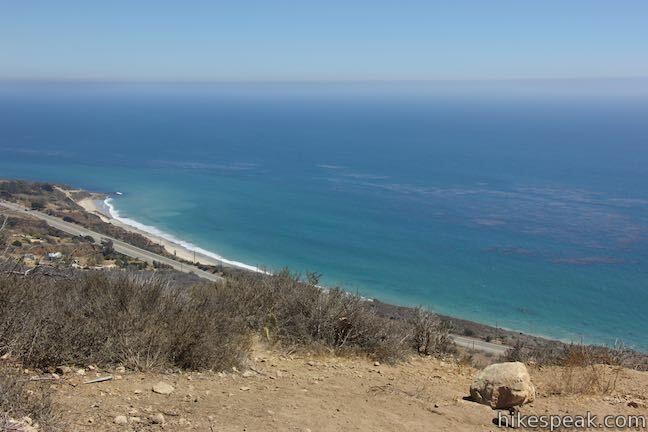 The ascent to the flats will leave you huffing and puffing, but the second spur to the ocean lookout is definitely worth it and not to be missed. 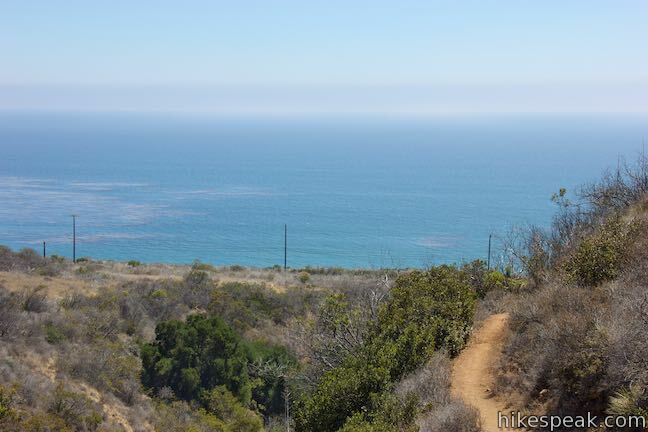 If I did the trail again, I’d cut out the last loop of the Nicholas Pond Trail. 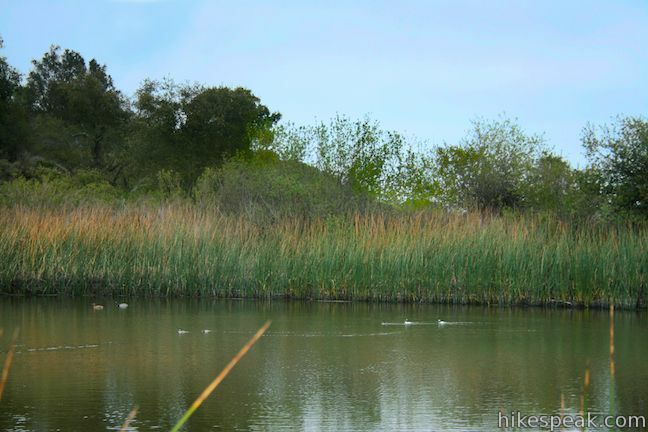 At least when I did the trail (November 2016), the pond was completely dried up and its man-made qualities of the boardwalk, bench, and bridge put me too close back in civilization – a quality that is welcomingly lacking for majority of this trail.